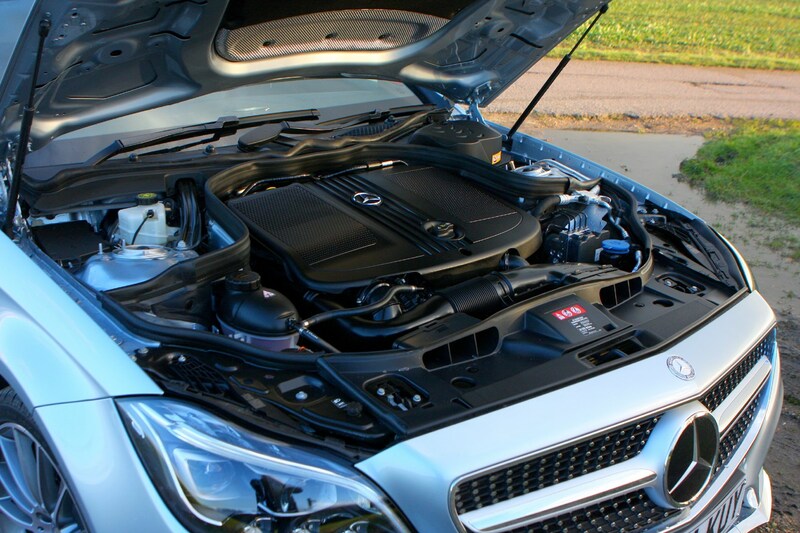 Insurance group: 37 - 47 How much is it to insure? 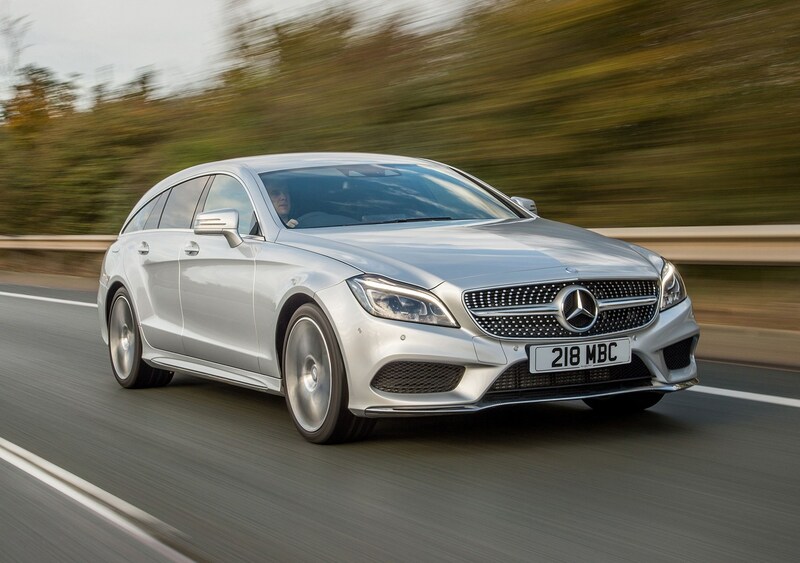 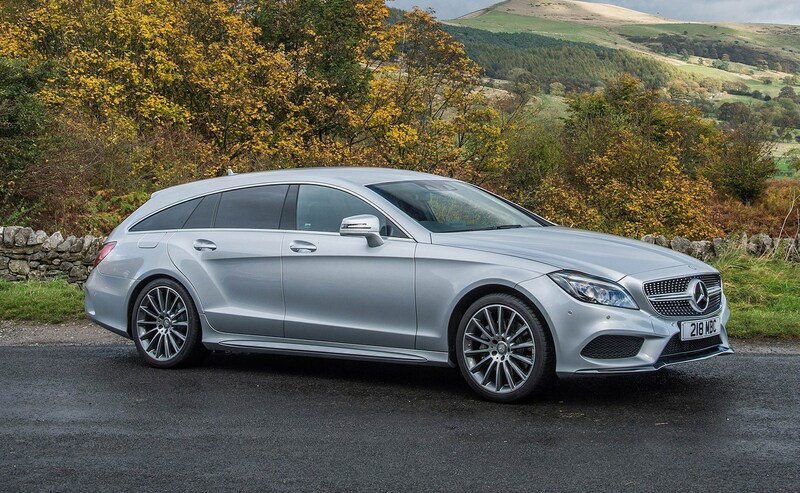 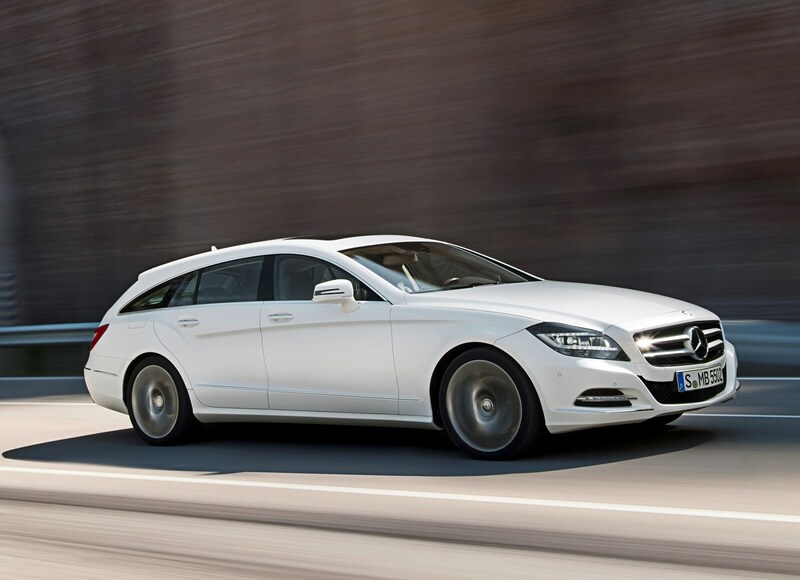 The Mercedes-Benz CLS Shooting Brake is a new breed of vehicle that fits firmly in the ‘sporty estate’ club that premium car manufacturers are now keen to exploit. 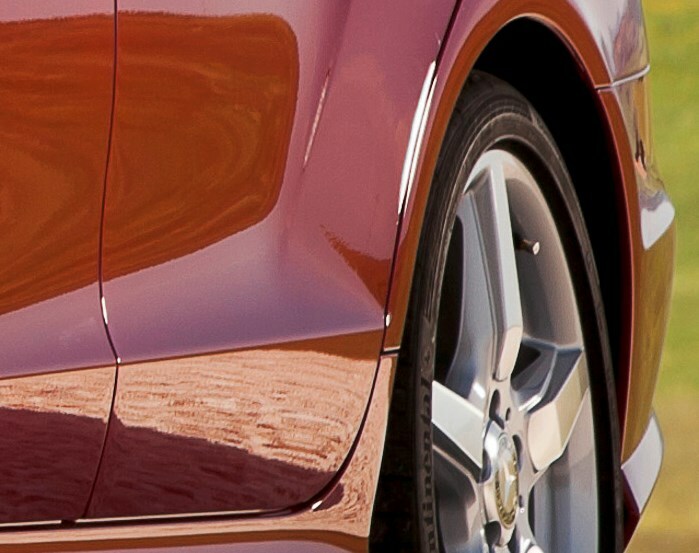 There’s clearly something appealing about a fast five-door. 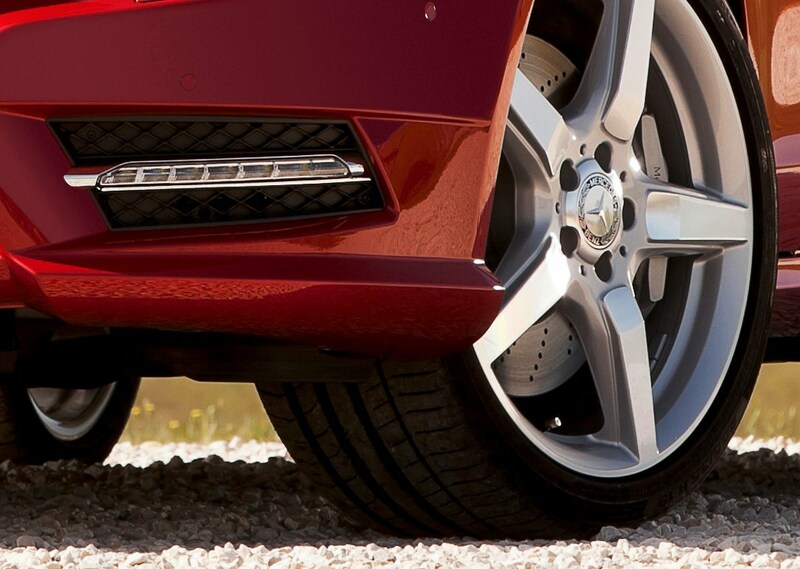 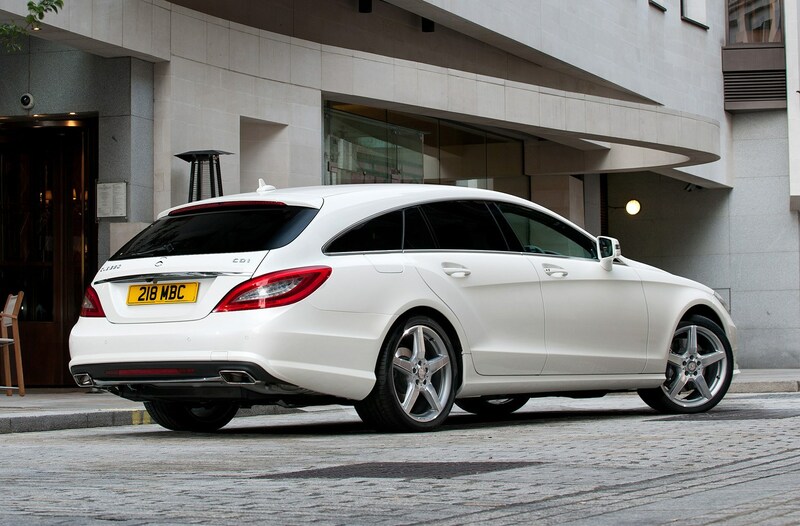 It’s the classic ‘you can have it all’ model, offering practicality and performance in one slick package. 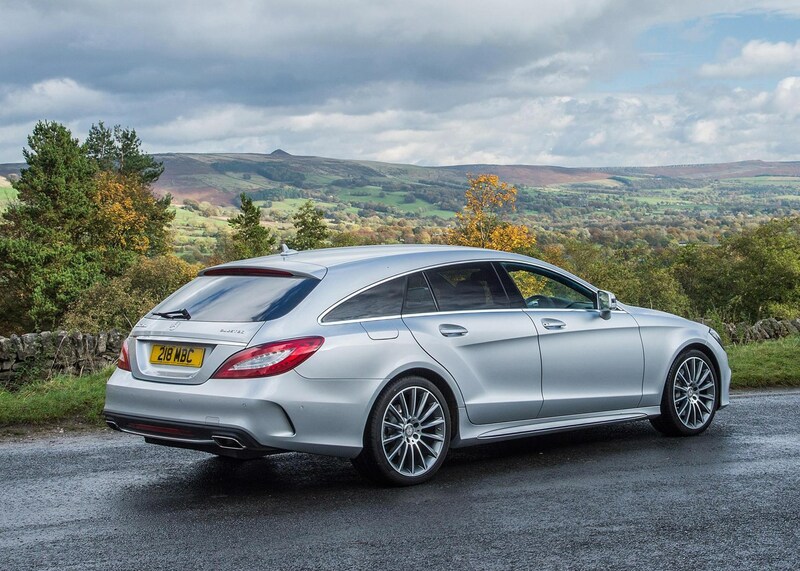 Mercedes-Benz isn’t holding back on the hyperbole either, claiming that the CLS Shooting Brake is ‘automotive independence at its most beautiful’. 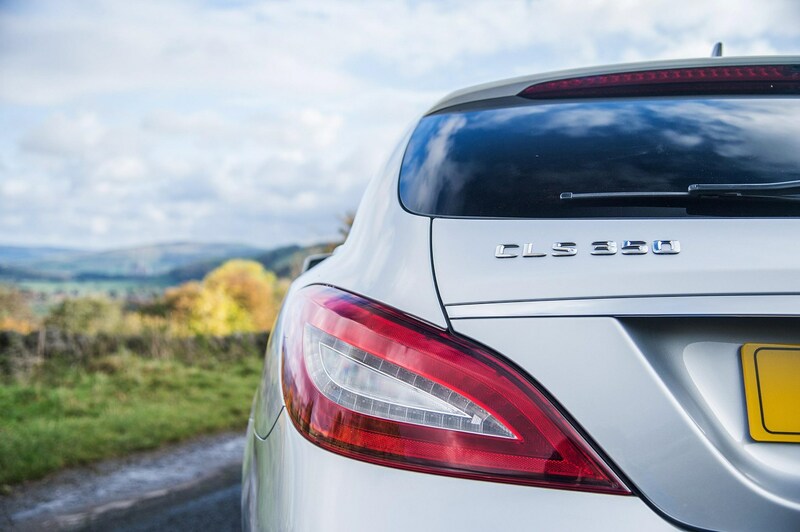 That’s arguable since the concept of ‘automotive independence’ is as nebulous as it comes, and beauty, well… that’s in the eye of the beholder. 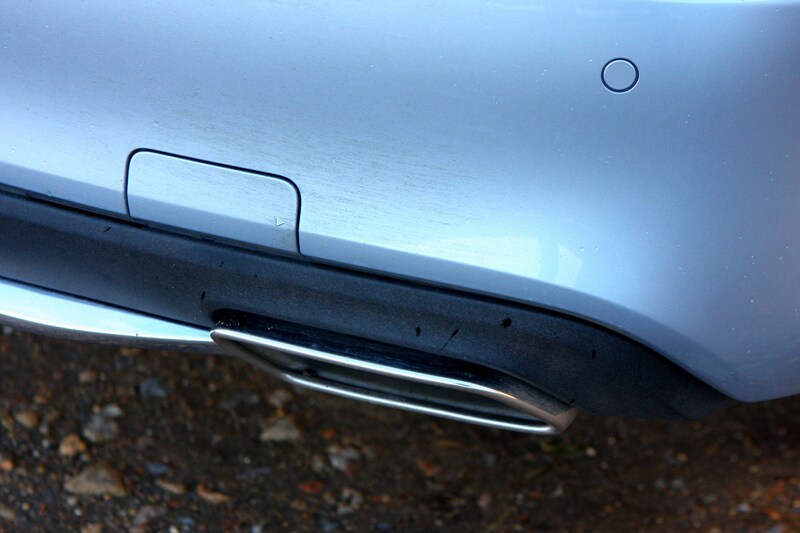 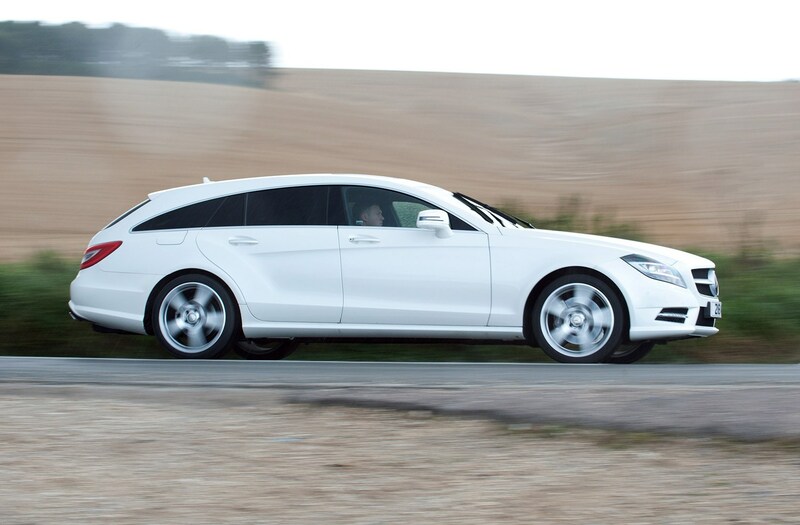 It’s called a Shooting Brake which, to the person on the street, is essentially a coupe with a tailgate. 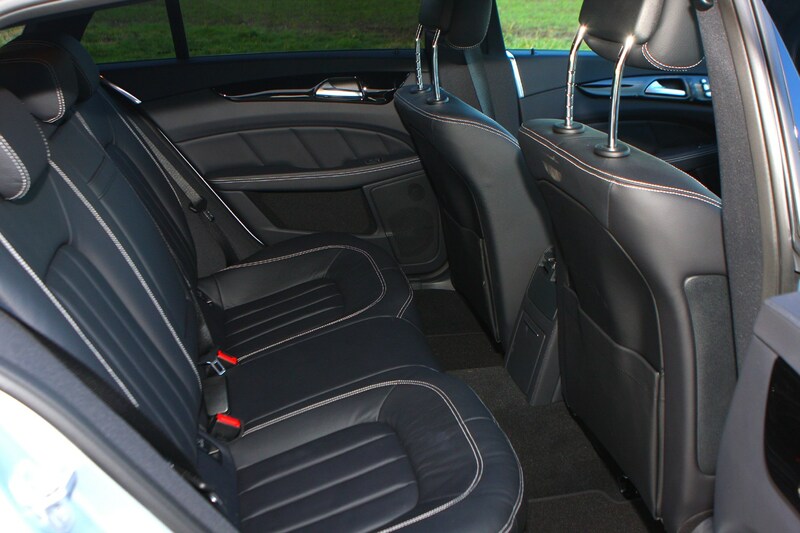 A sort of jumped-up estate, if you will.Inside the CLS there are five seats but the middle seat is a token gesture and only fit for small people. 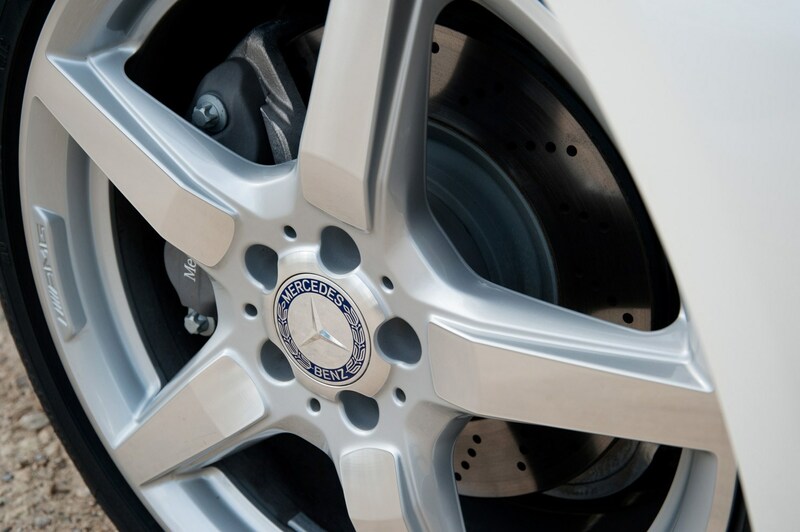 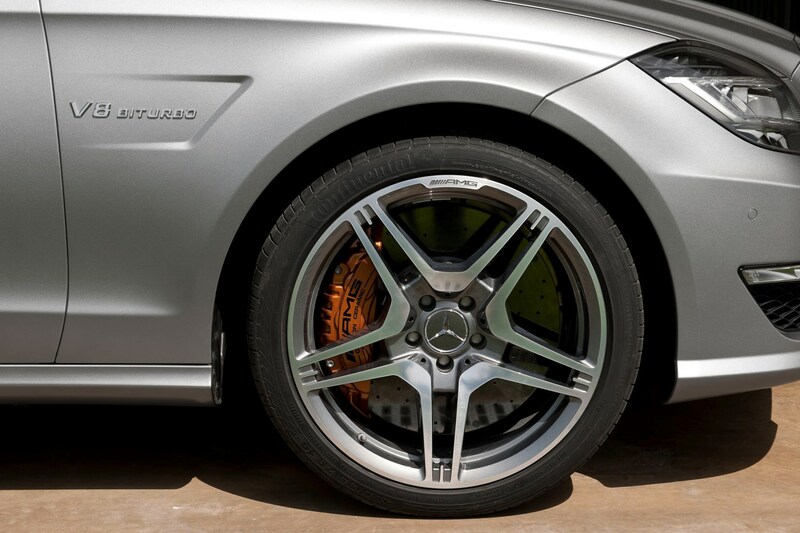 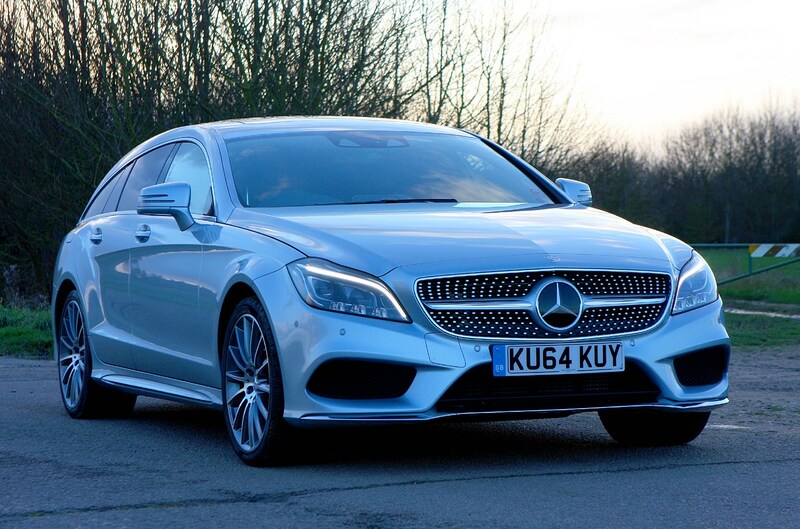 It’s not much more expensive than the Coupe and the go-faster AMG versions are only slightly more expensive than their four-door equivalents. 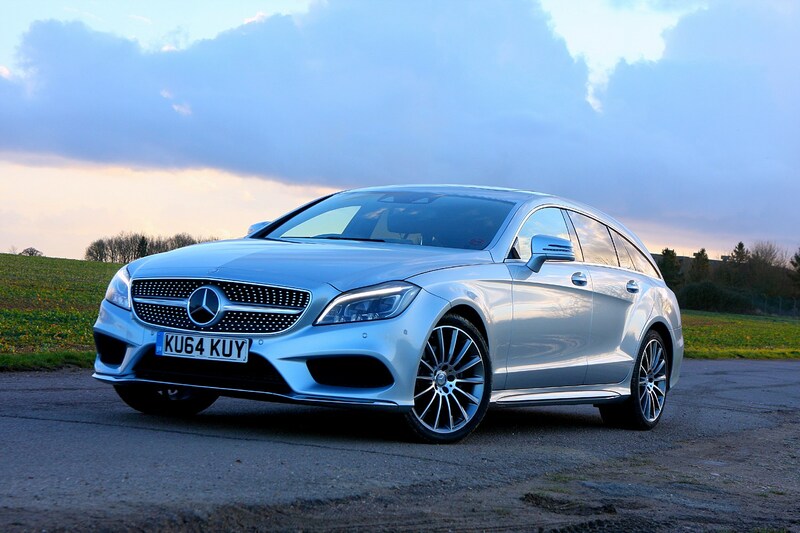 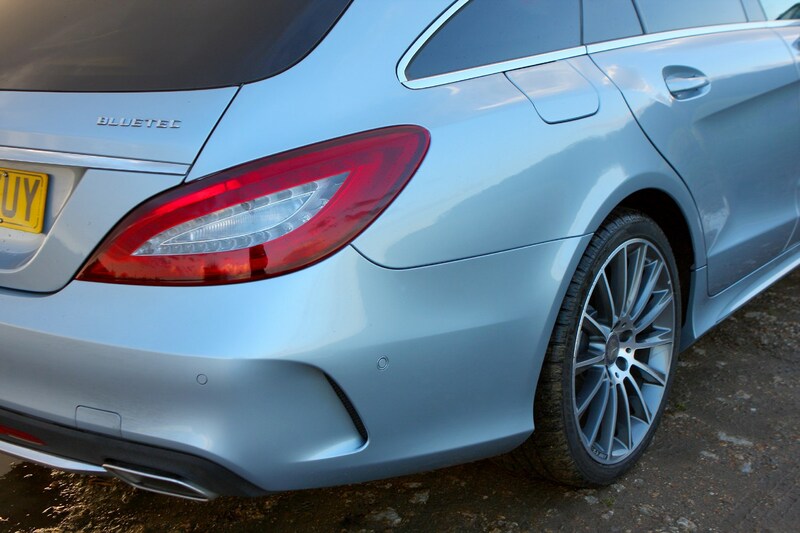 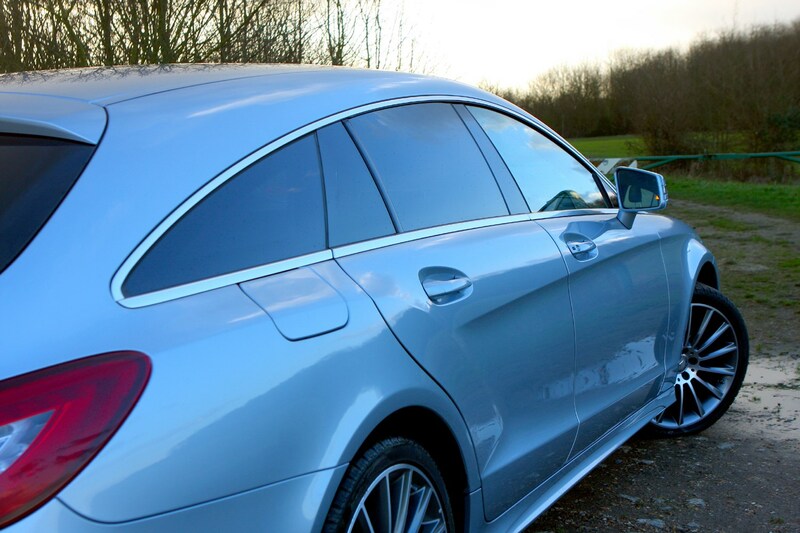 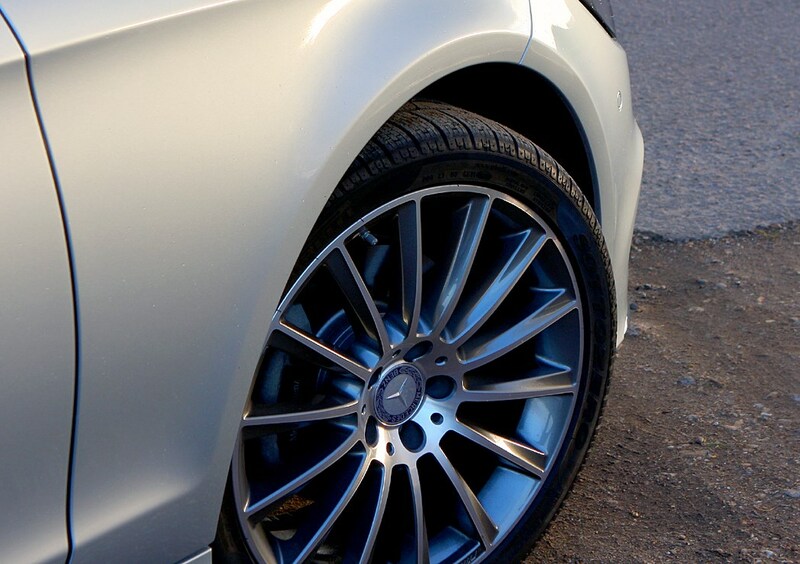 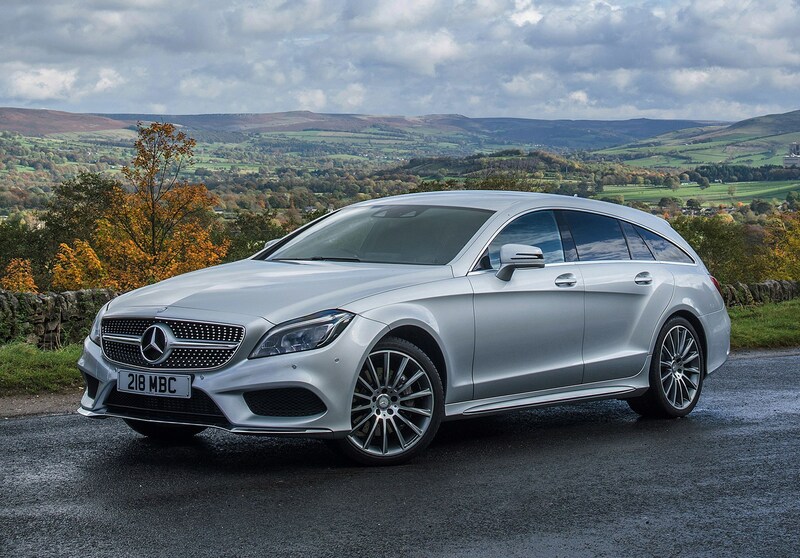 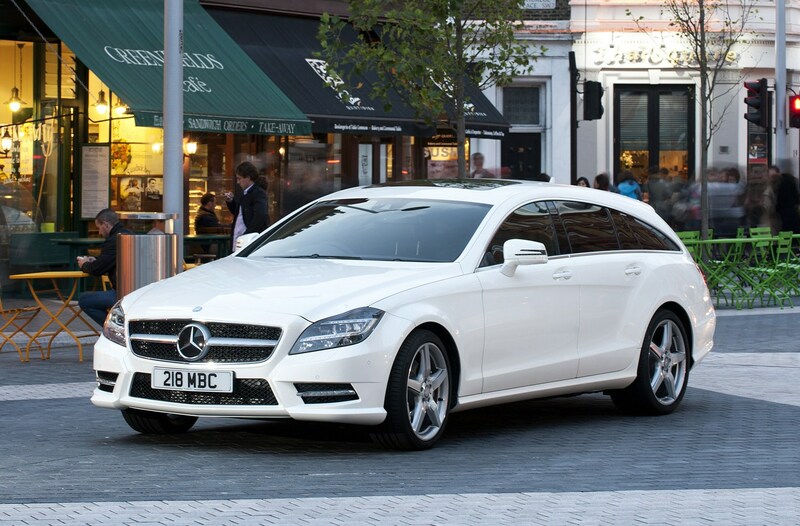 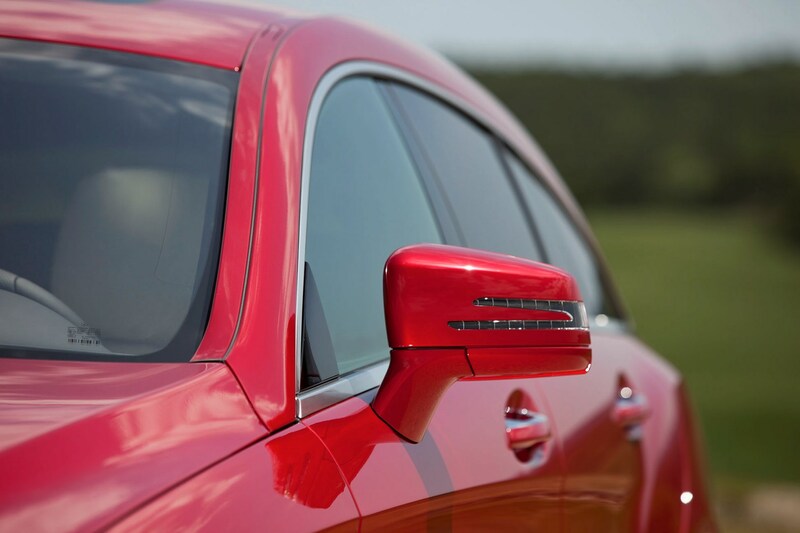 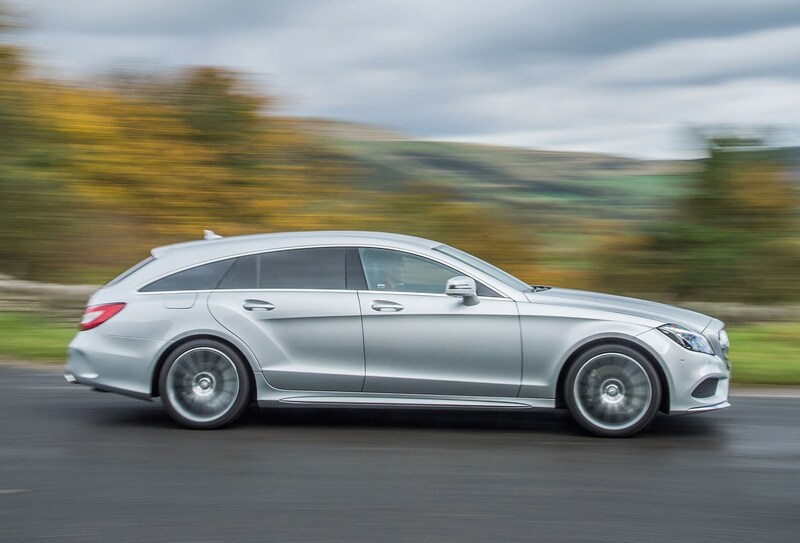 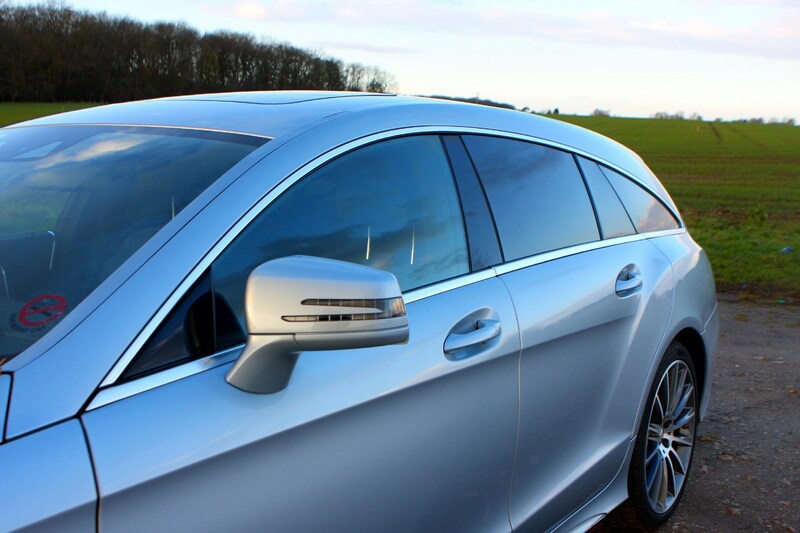 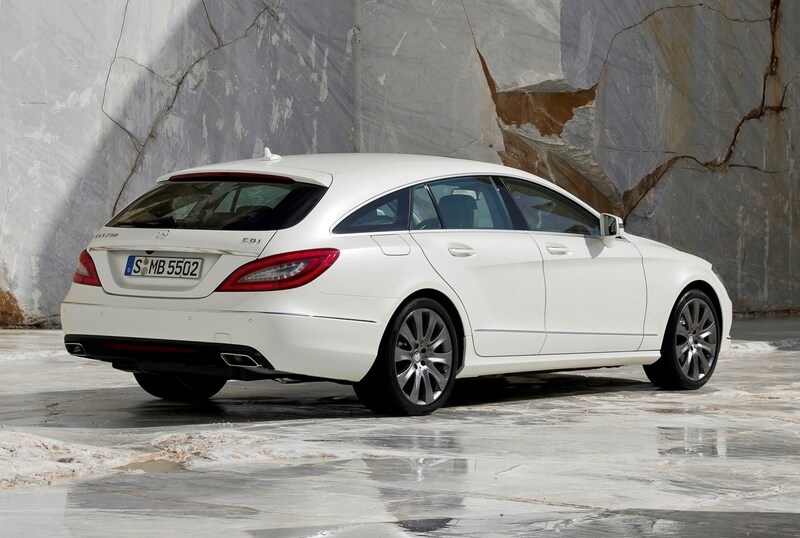 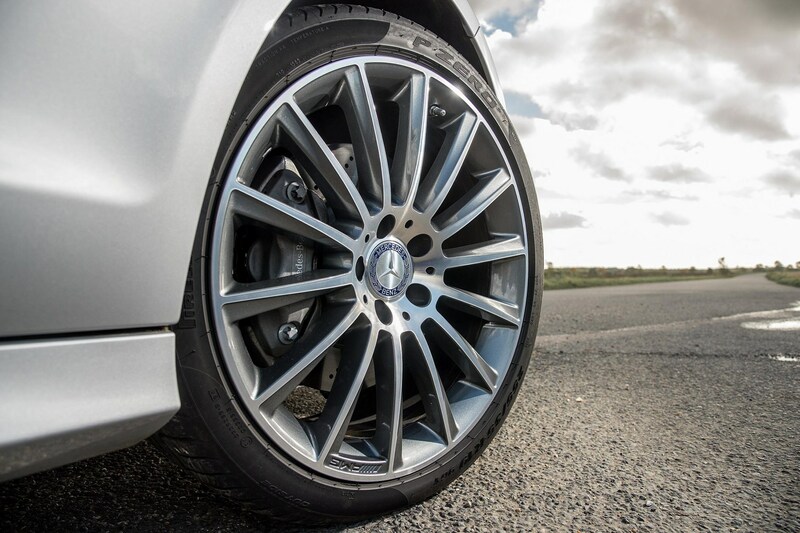 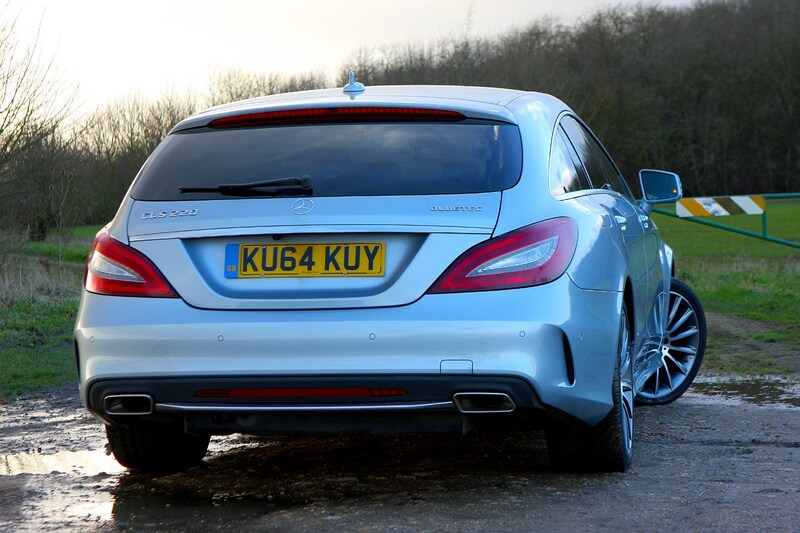 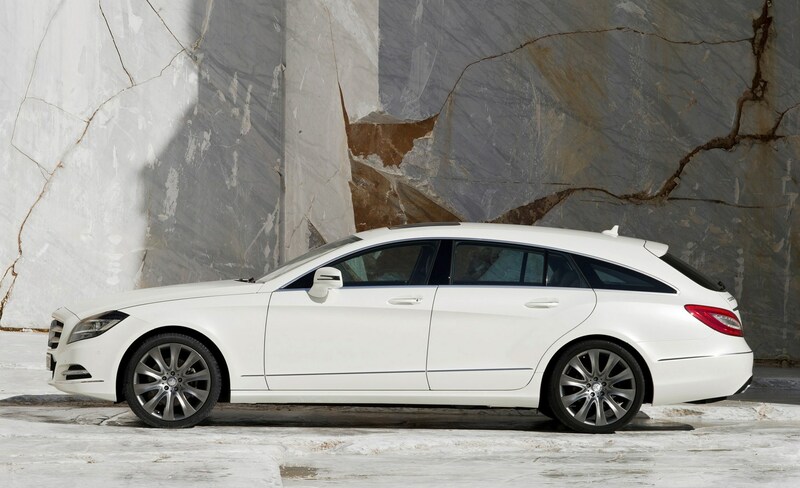 There’s no doubting the CLS Shooting Brake is a classy piece of kit that’ll appeal to the well-heeled. 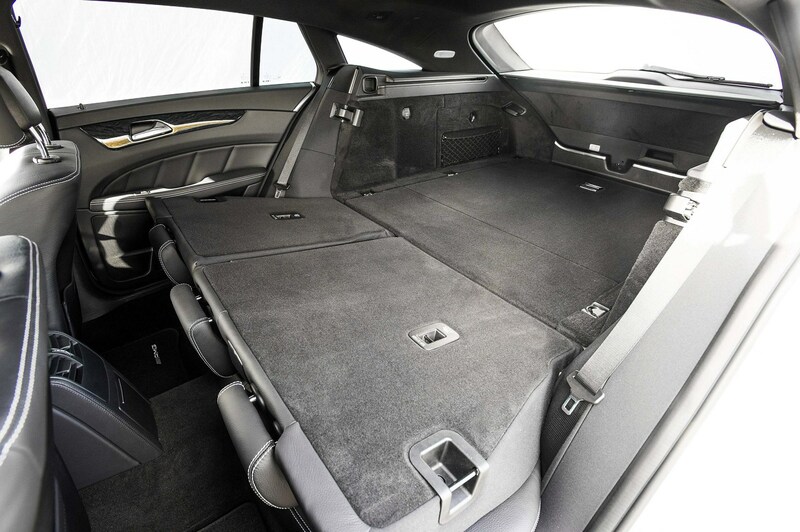 There’s loads of hand-stitched leather, a luggage compartment lined with high-quality carpet and if you want to really set yourself even further apart from the proletariat you can fit optional designer aluminium loading rails or a curiously described ‘designo’ wooden luggage compartment floor. 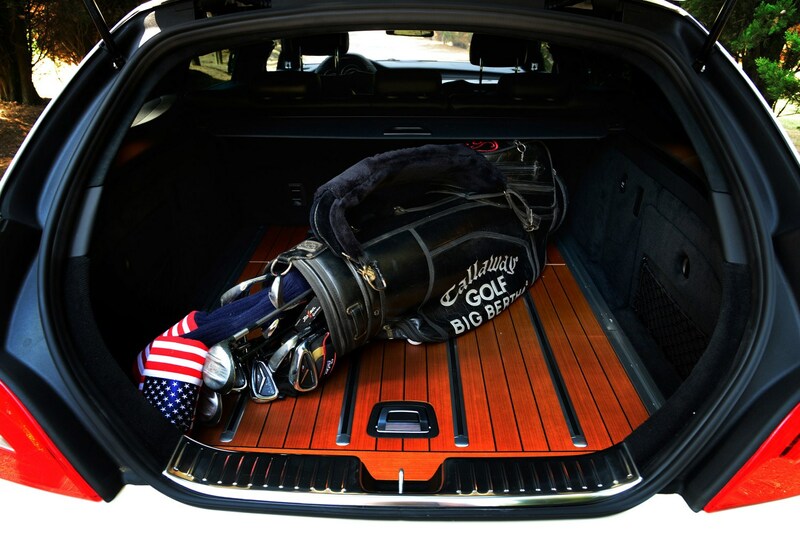 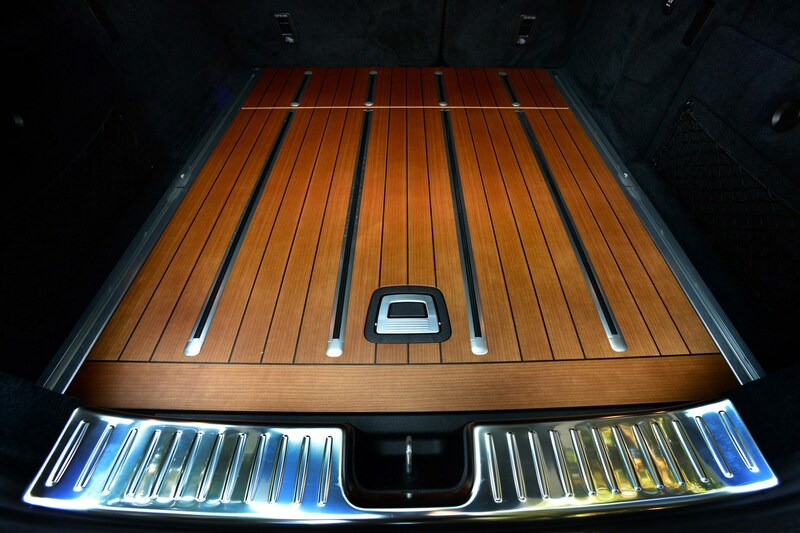 Cherry tree wood has been harvested for the CLS and it combines with the inlaid smoked oak and aluminium rails in the boot. 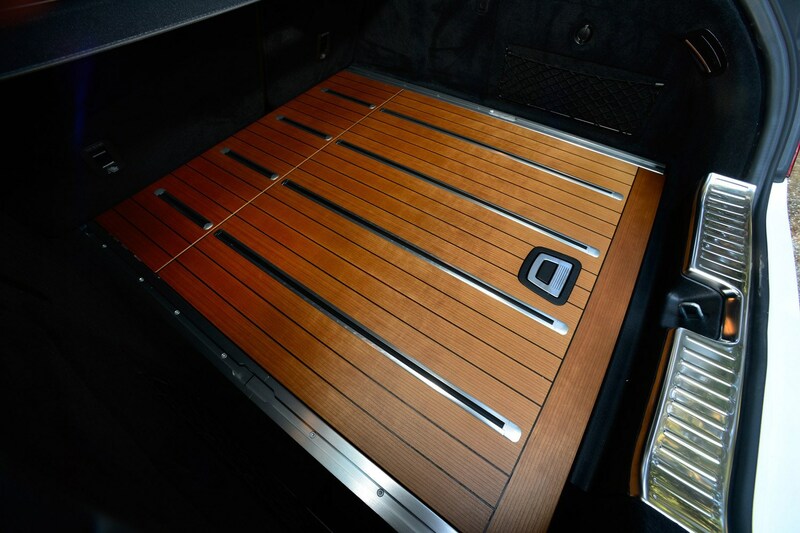 This is the sort of stuff you see on yachts, so if you’re moderately loaded you’ll feel positively Abramovich-esque if you buy one of these and feel satisfied that your boot looks like a boat deck. 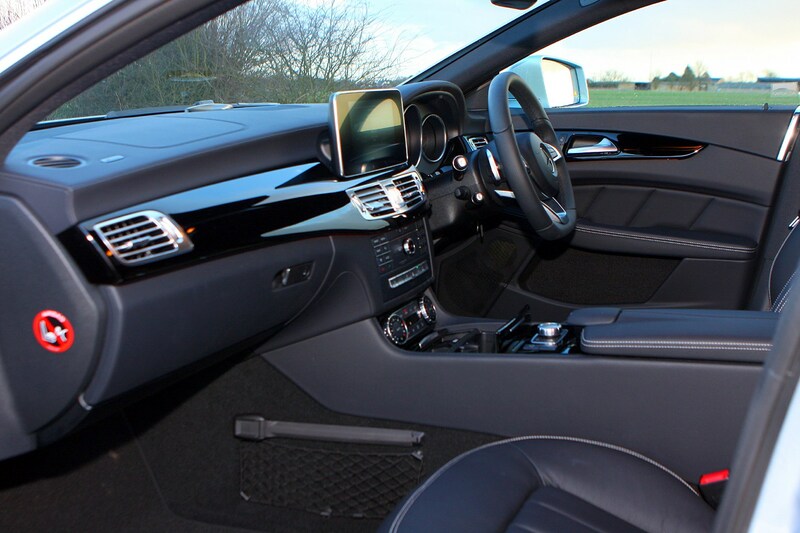 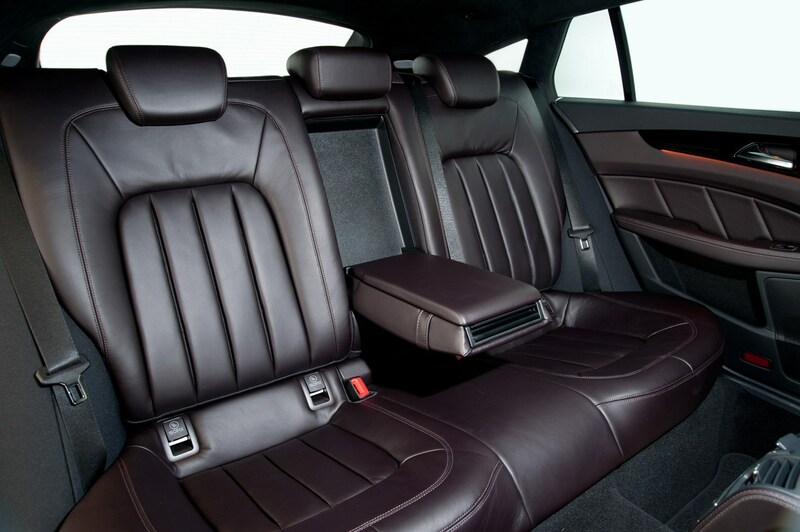 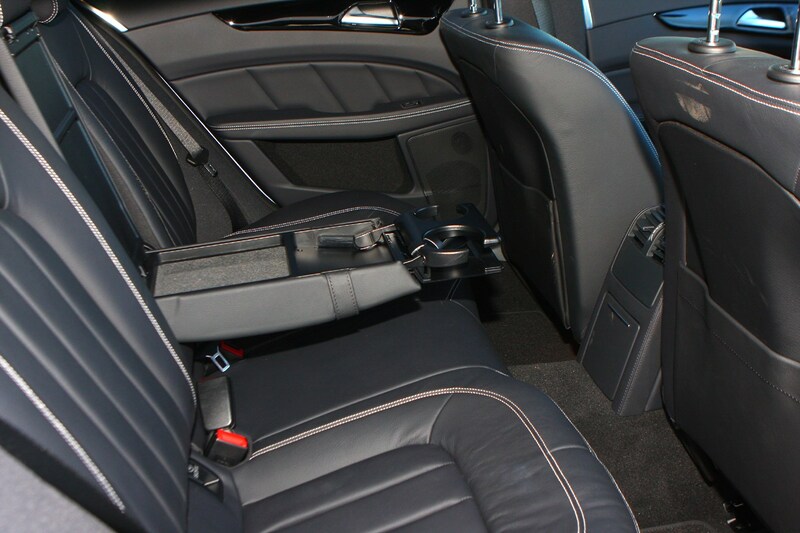 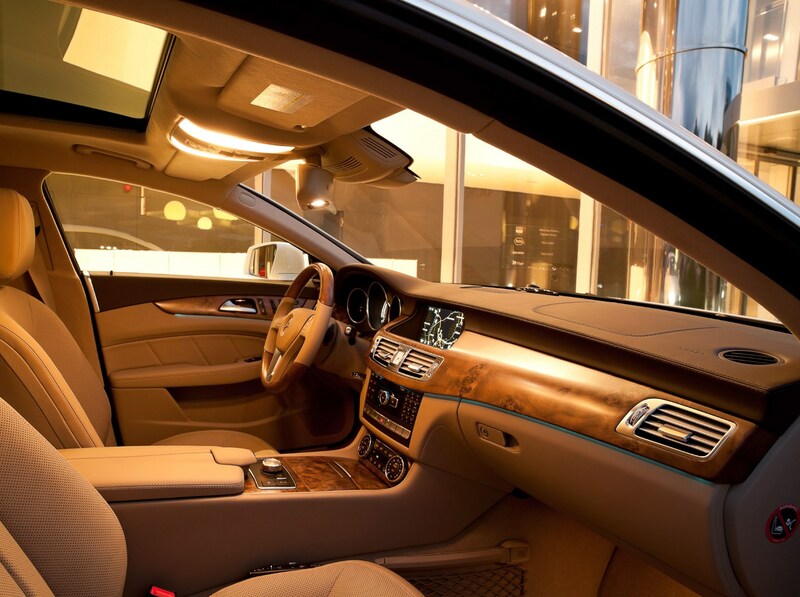 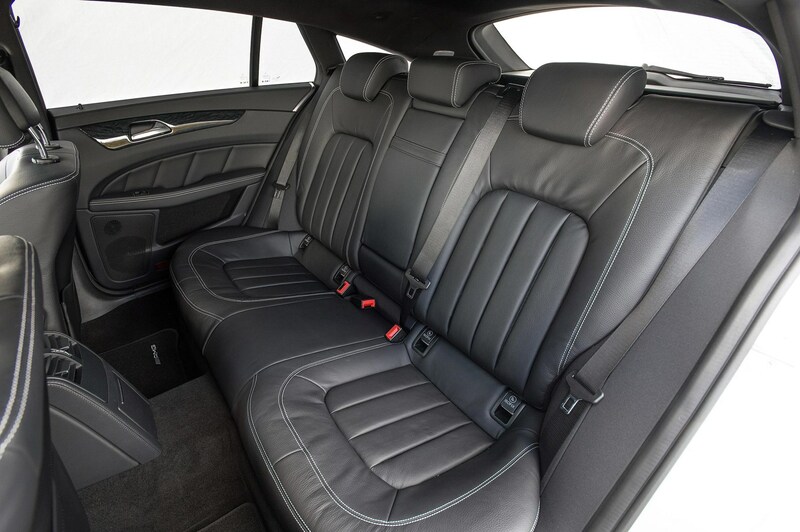 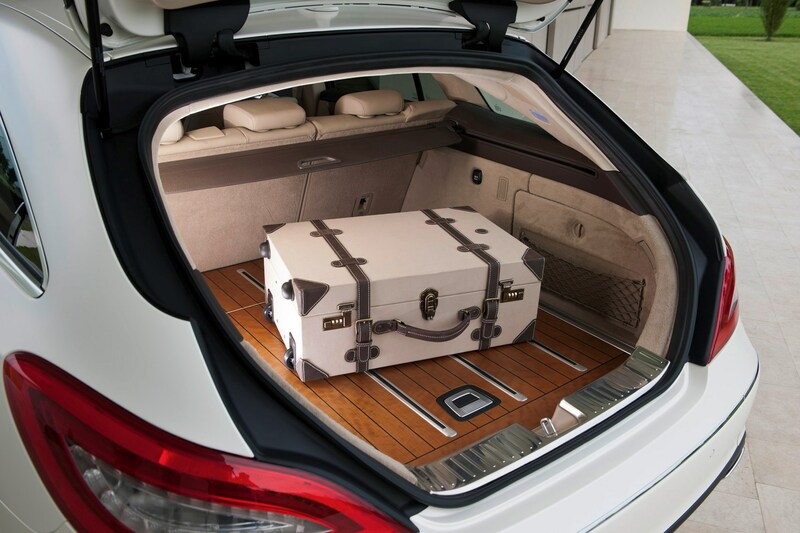 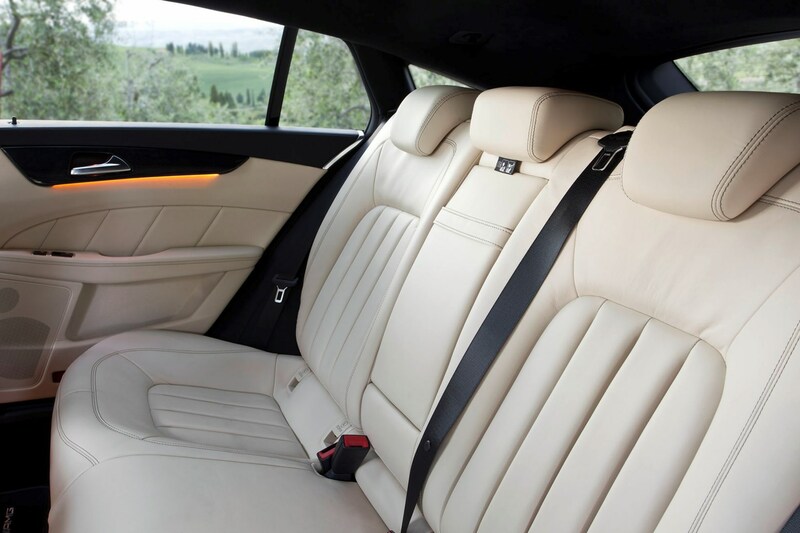 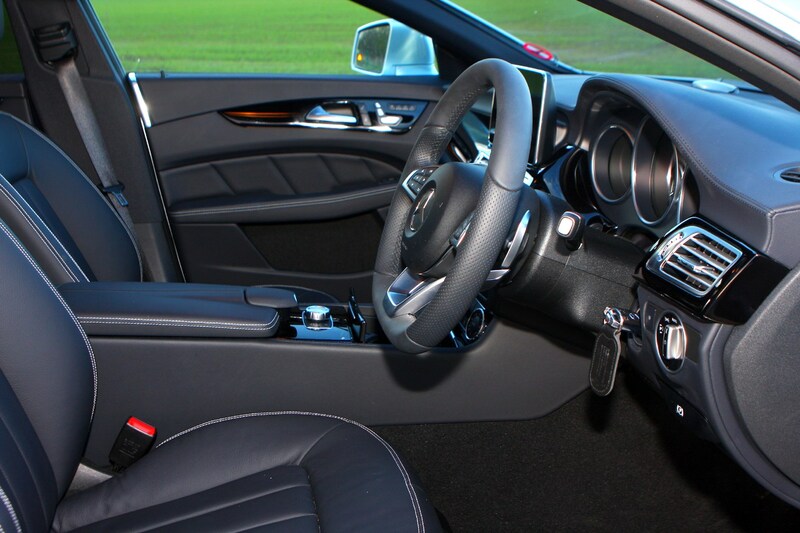 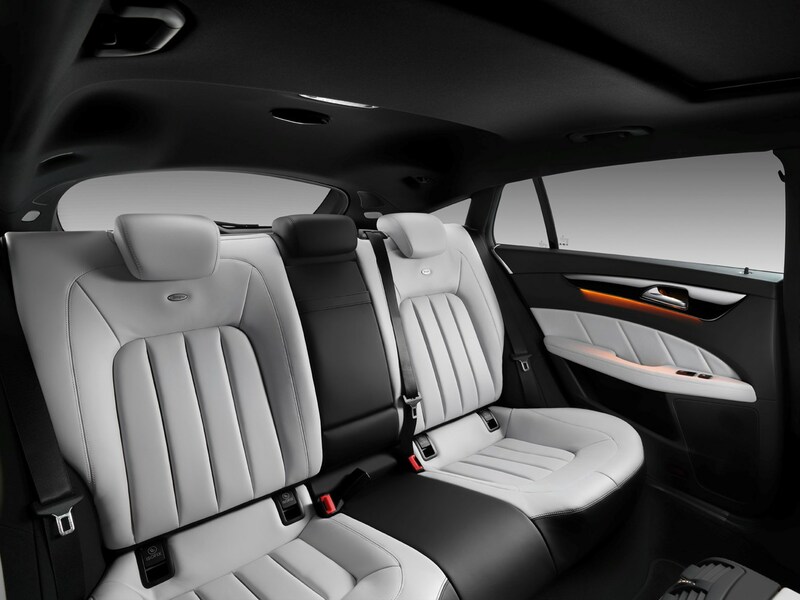 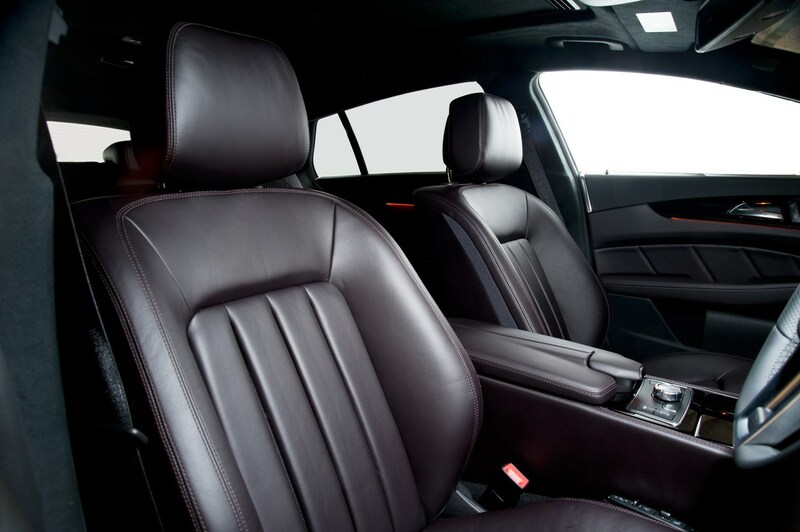 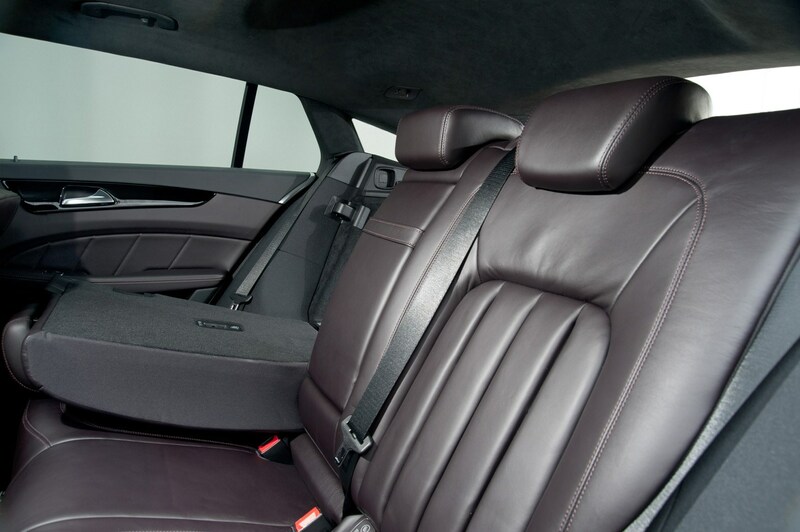 The Shooting Brake offers five interior colours, five trim designs and three qualities of leather to choose from. 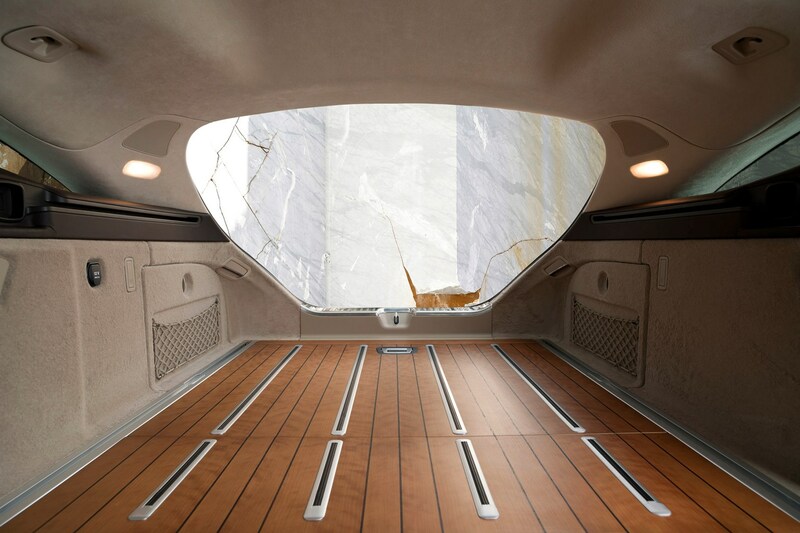 Customers have a choice of three exclusive wood types: high-gloss brown burr walnut, high-gloss black ash and satin-finish light-brown poplar. 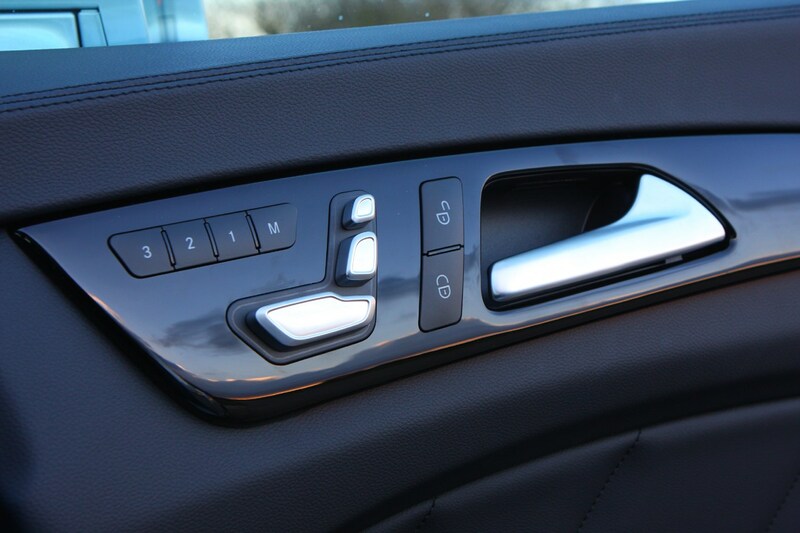 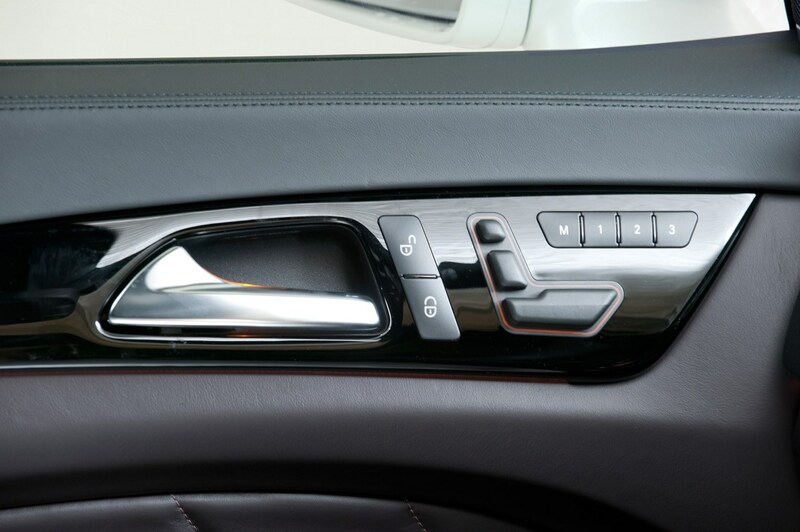 A completely new addition comes in the form of porcelain interior detailing and that’s alongside a mixture of satin and high-gloss finishes used on the metal surfaces. 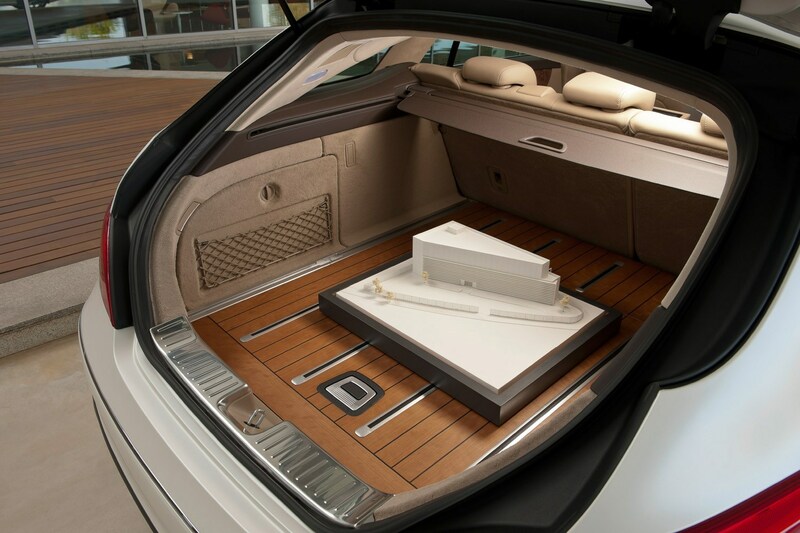 In terms of practicality, it’s pretty imperious. 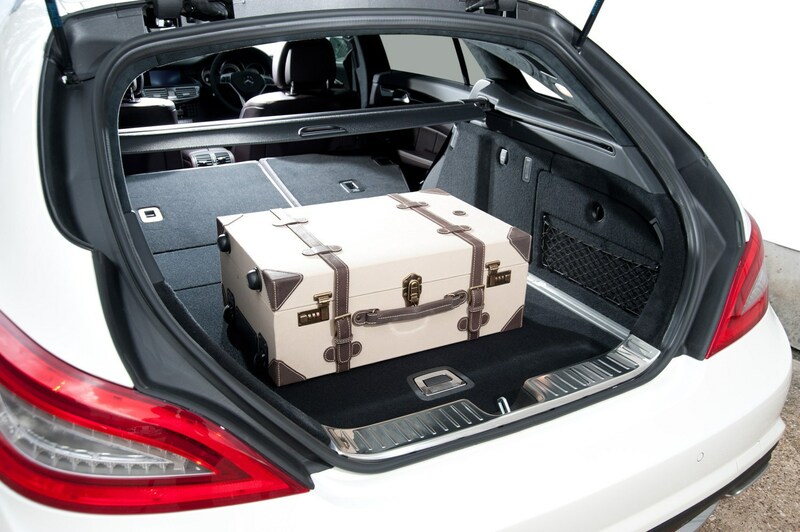 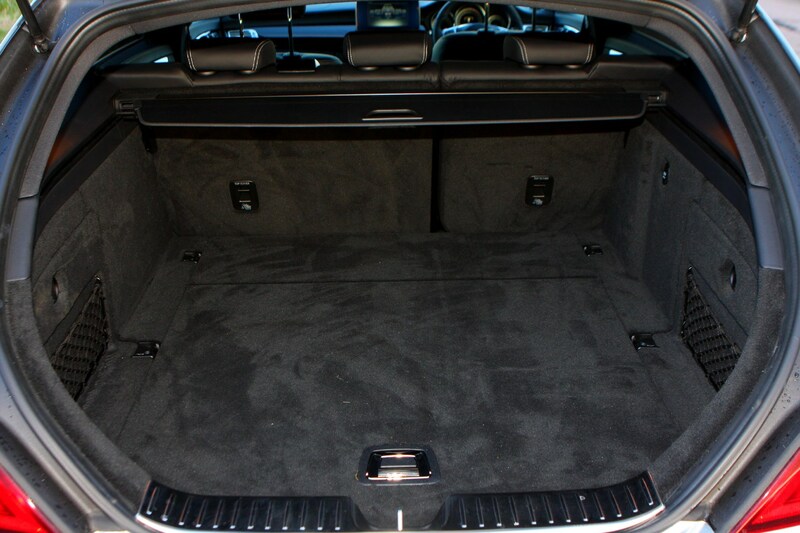 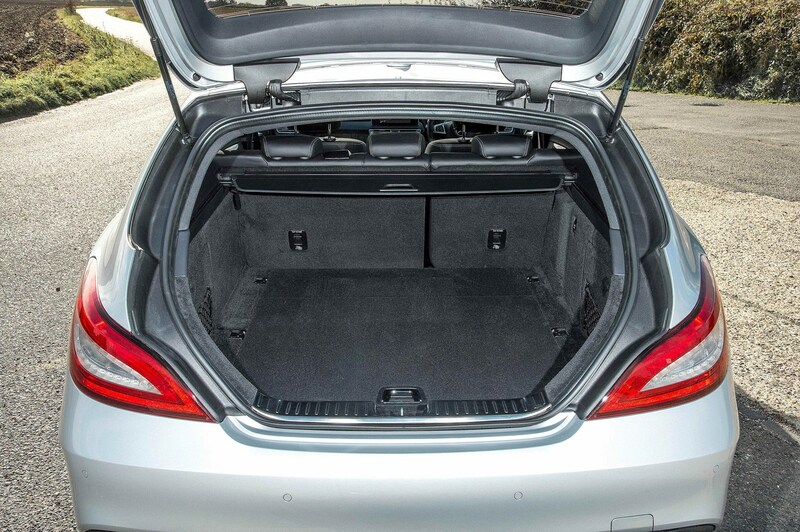 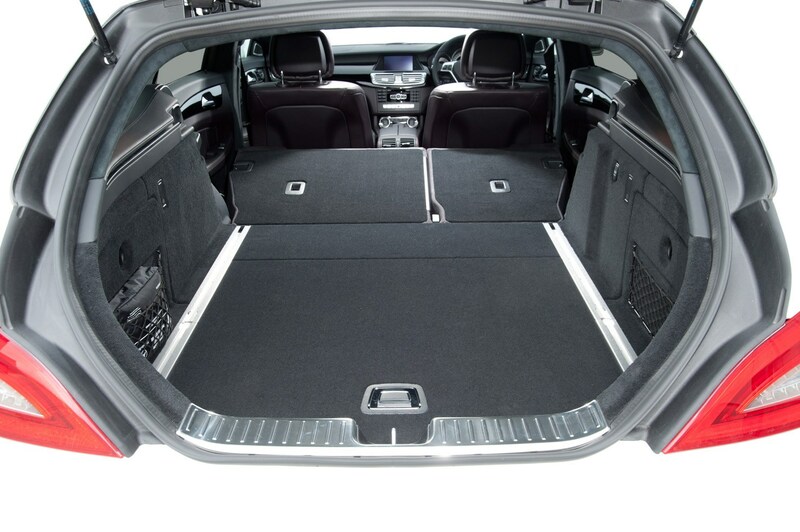 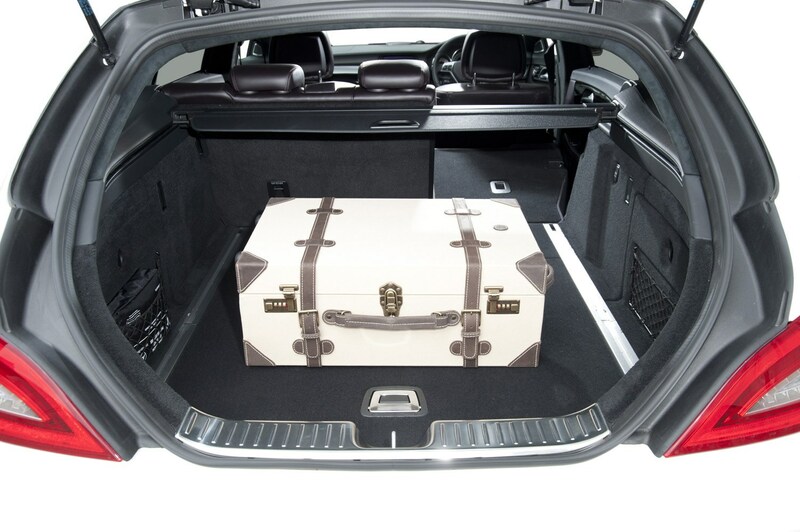 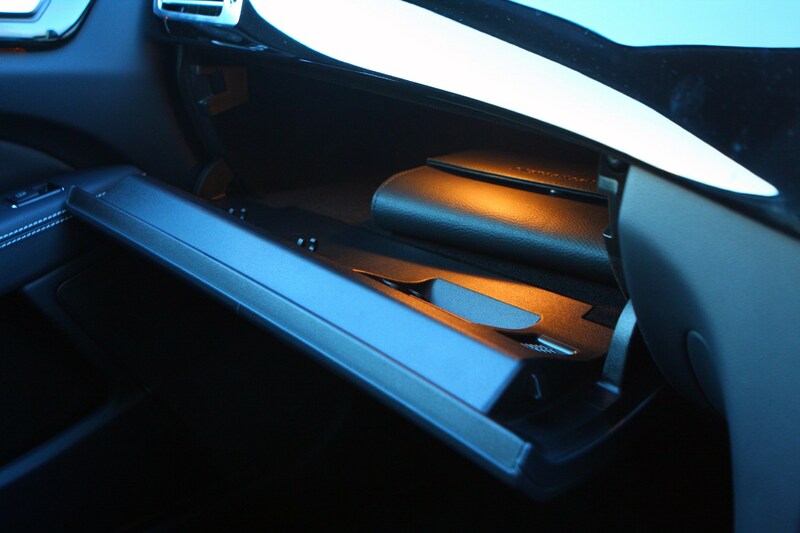 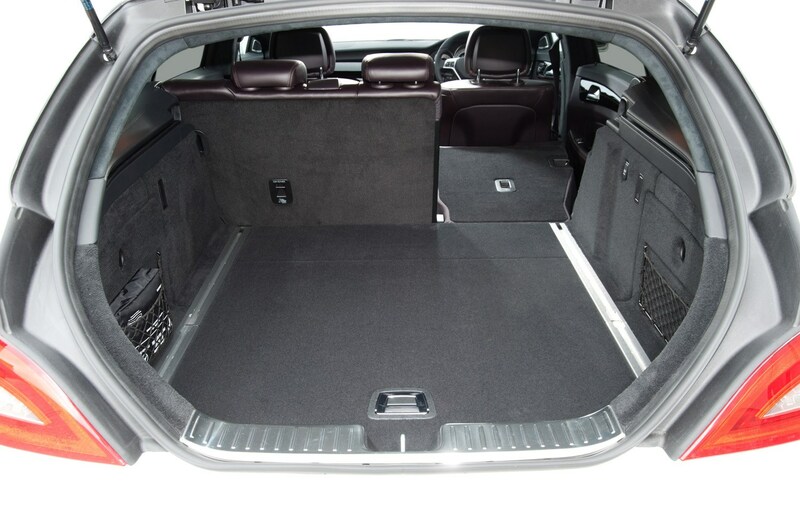 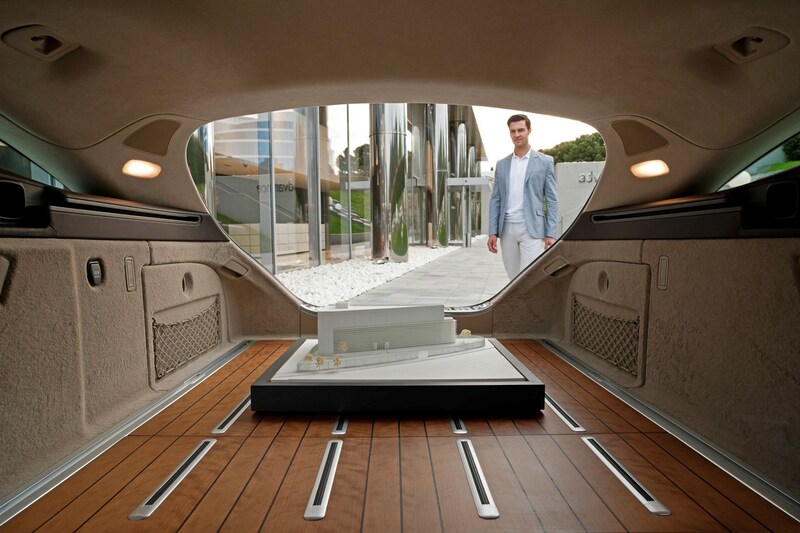 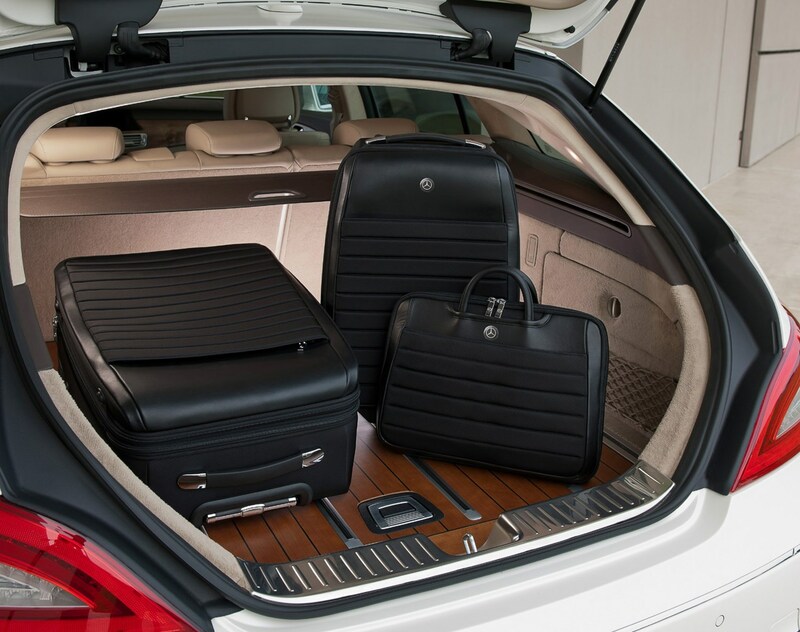 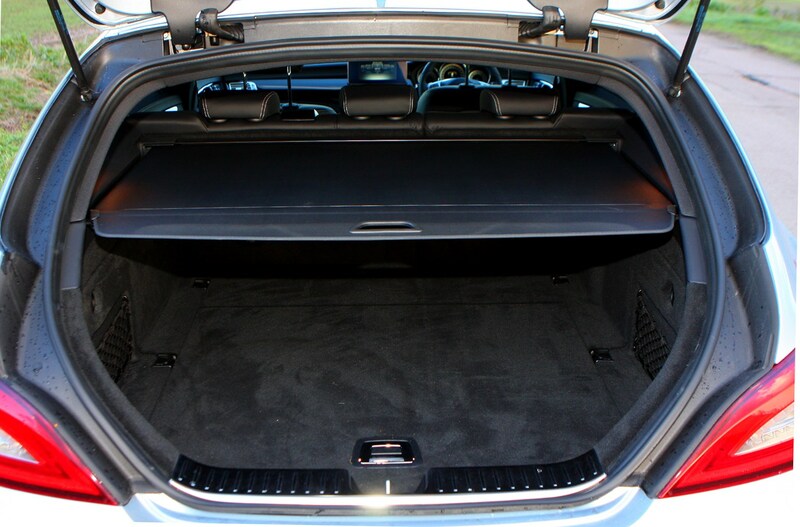 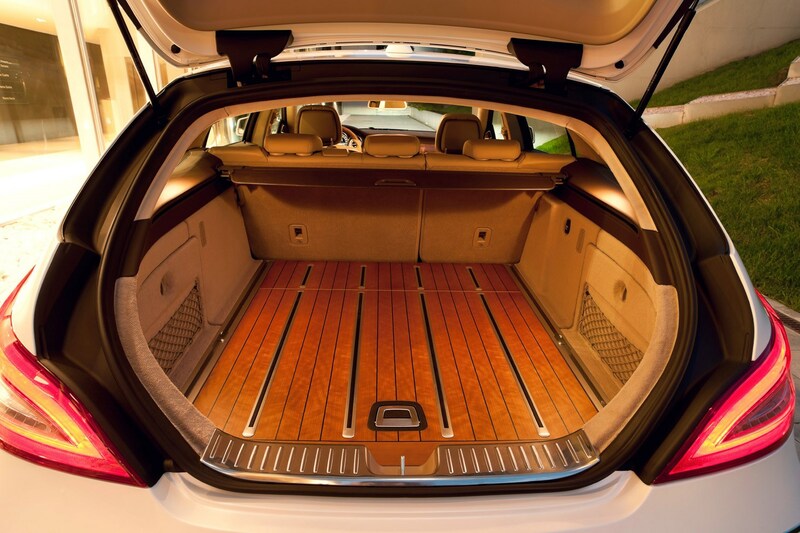 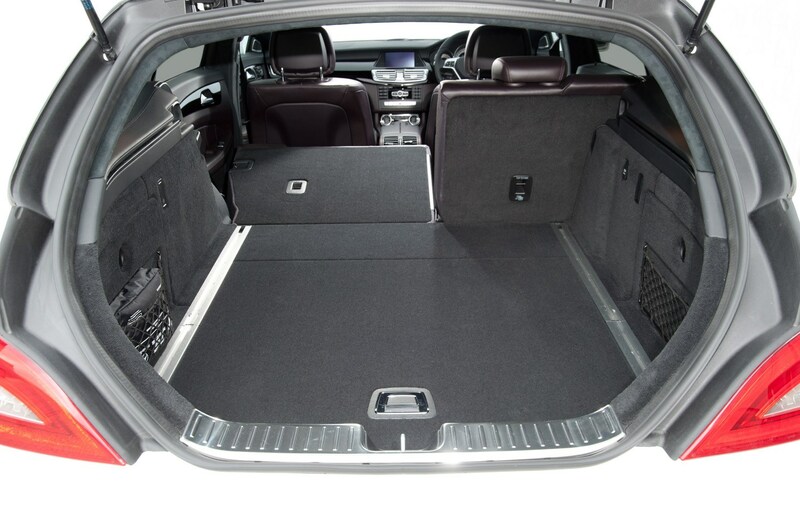 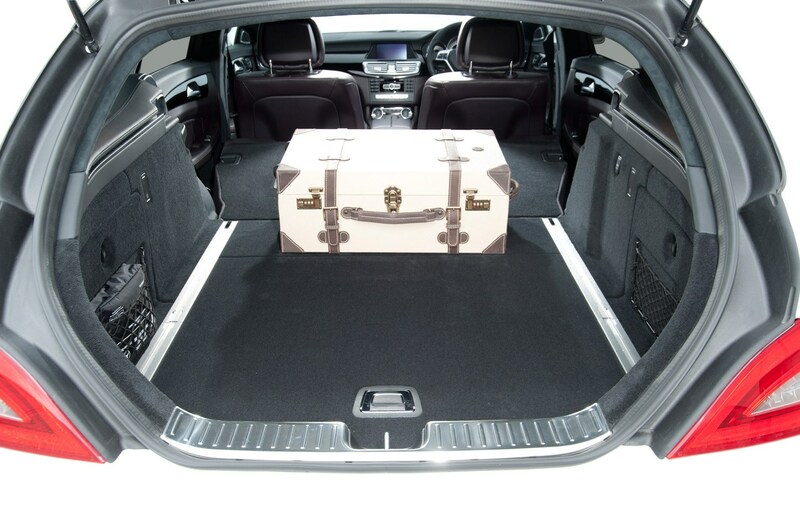 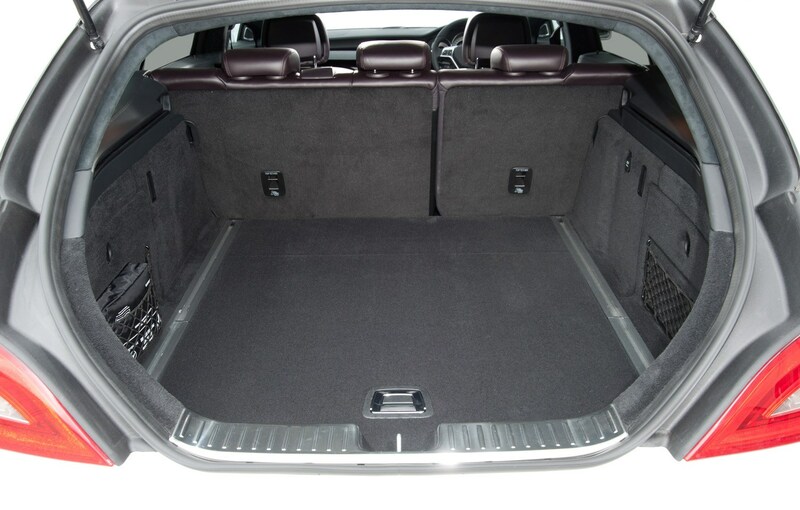 The boot offers 590 litres of stowage space with the rear seats up and 1,550 litres with them down. 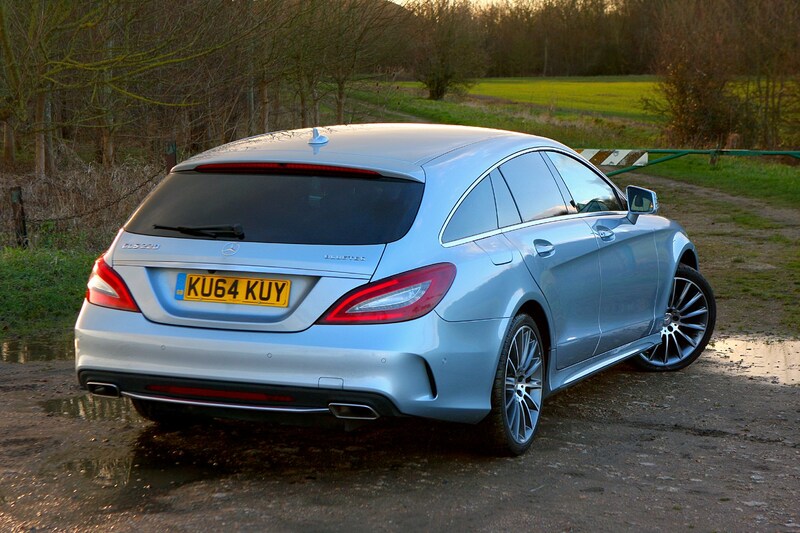 That’s bigger than a standard C-Class Estate, but nowhere near an E-Class though. 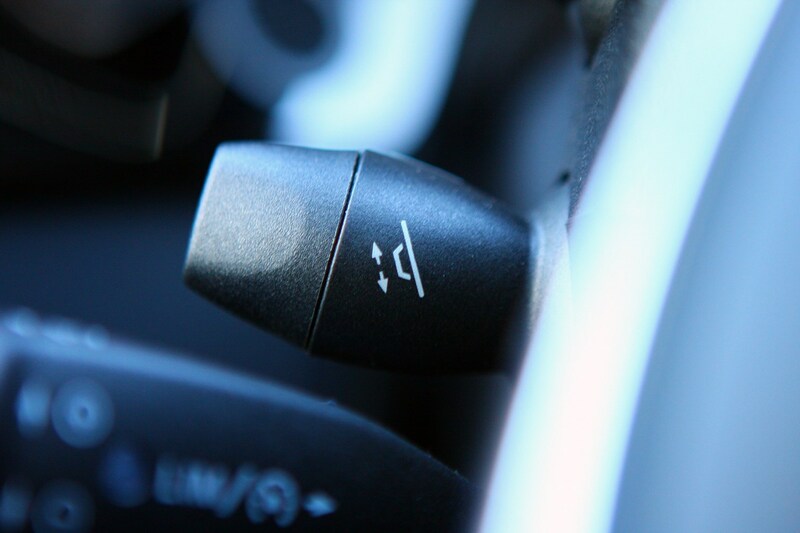 An optional trailer coupling is also available. 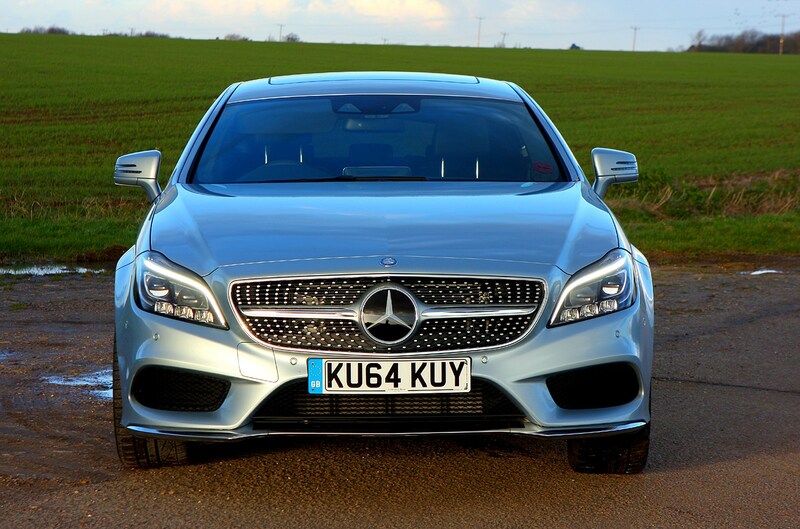 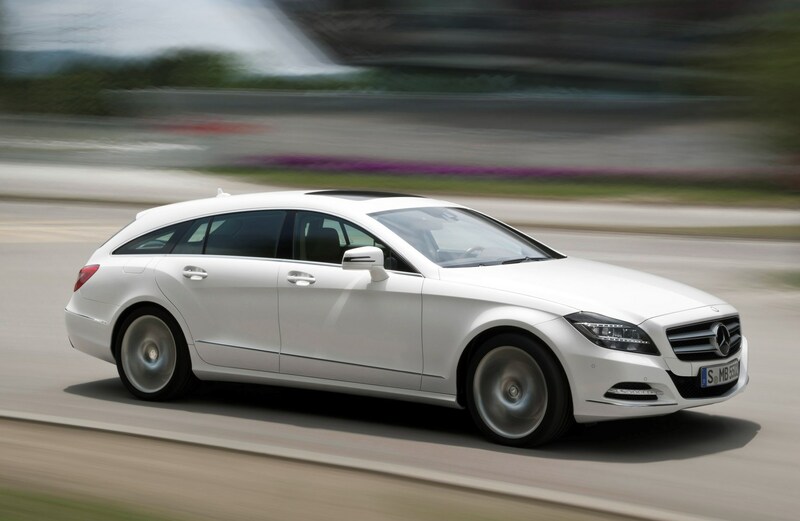 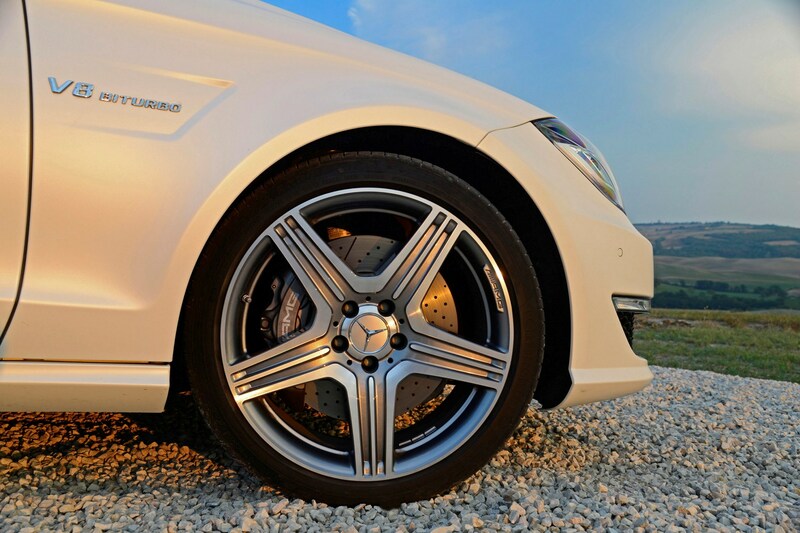 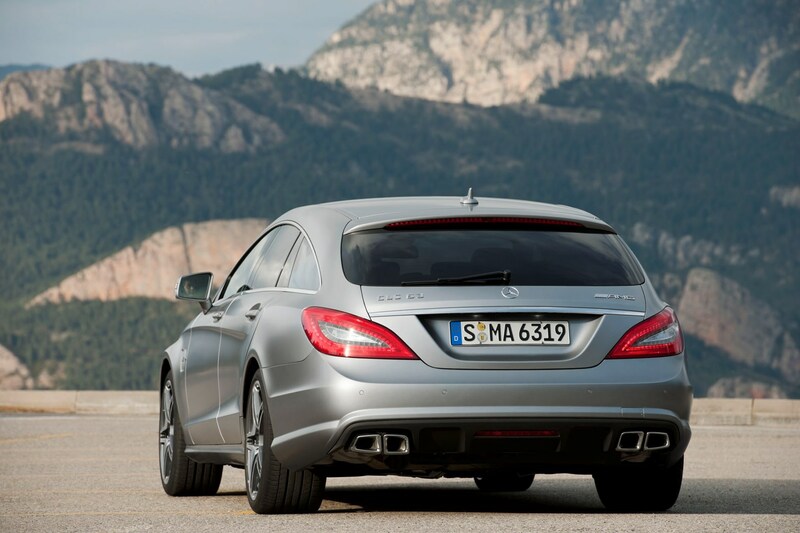 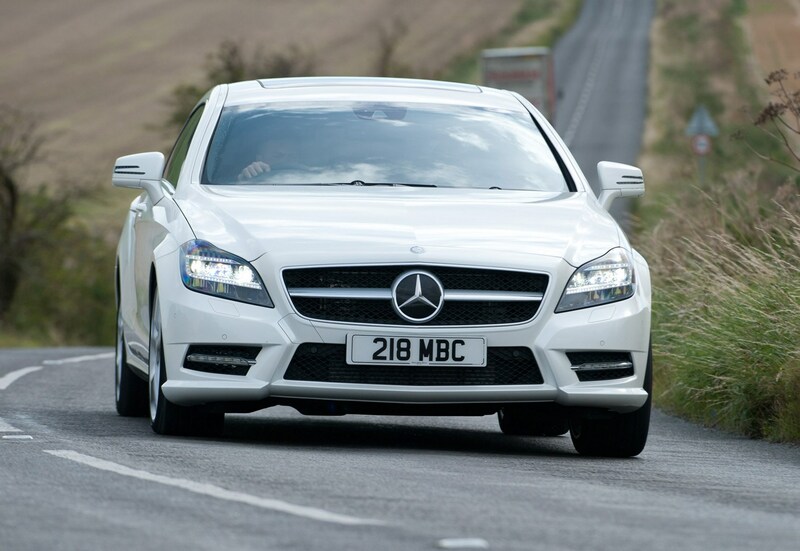 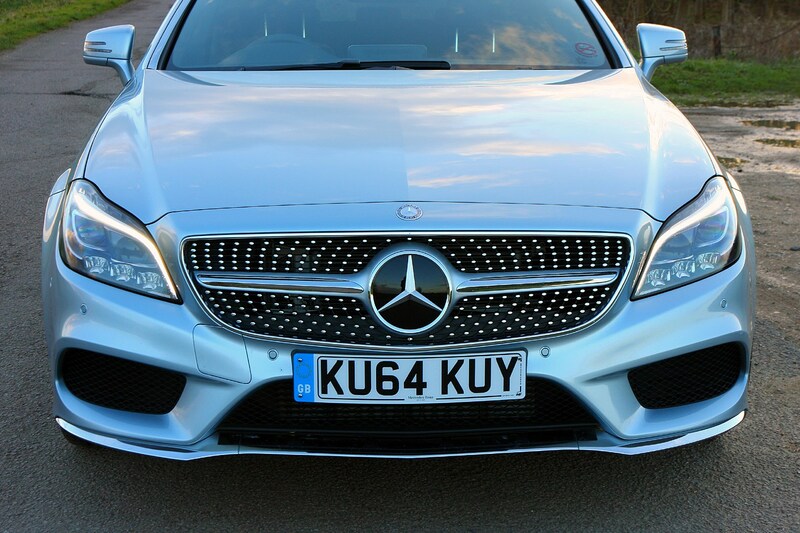 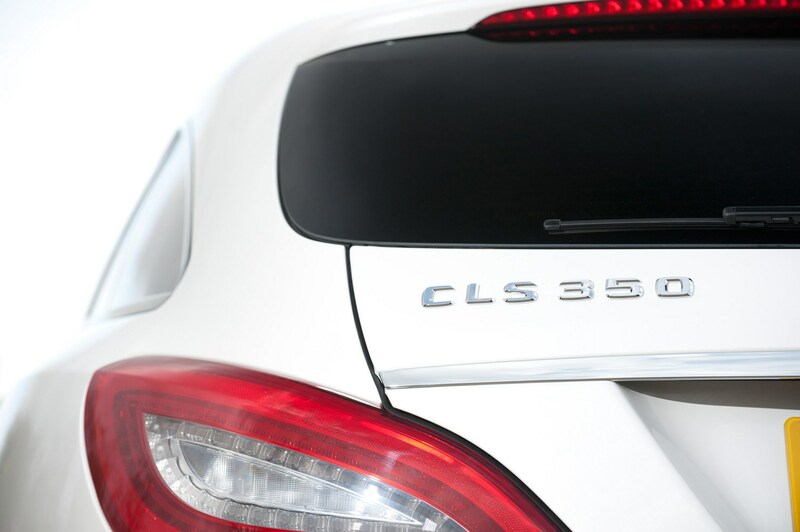 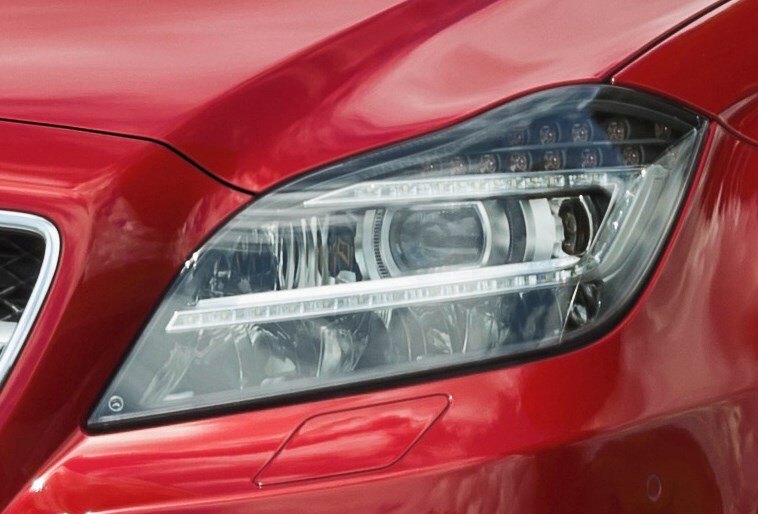 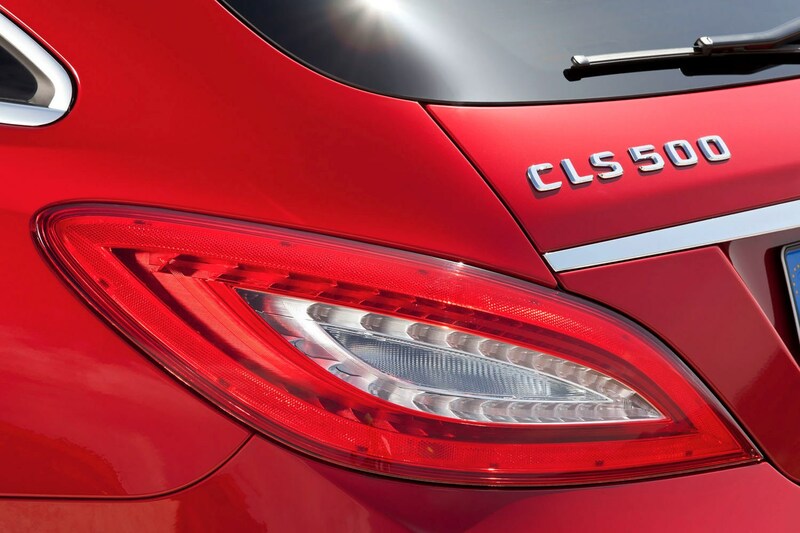 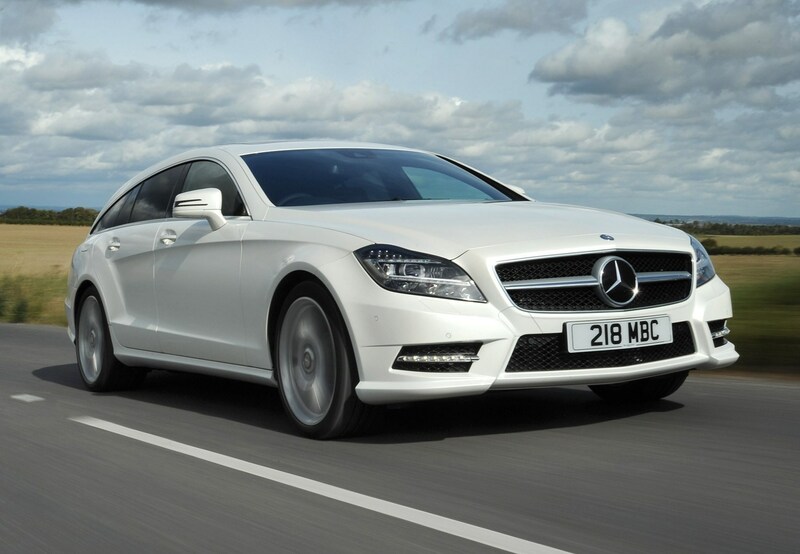 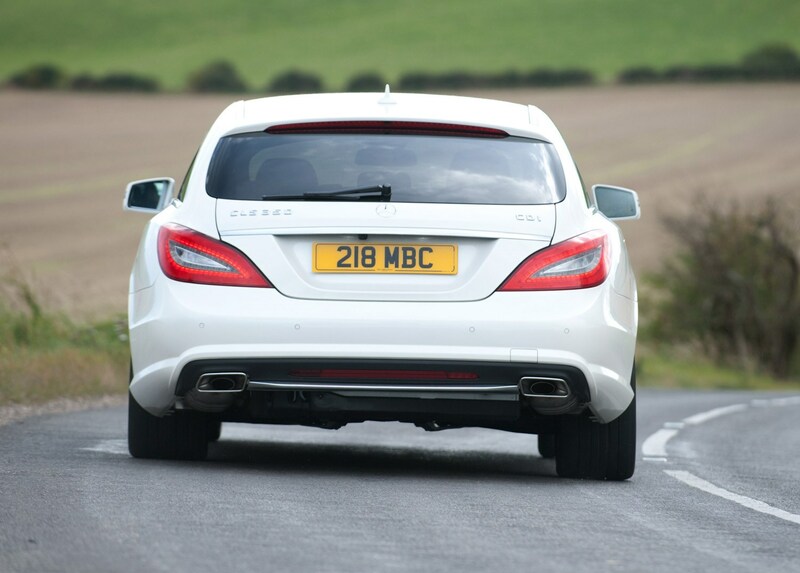 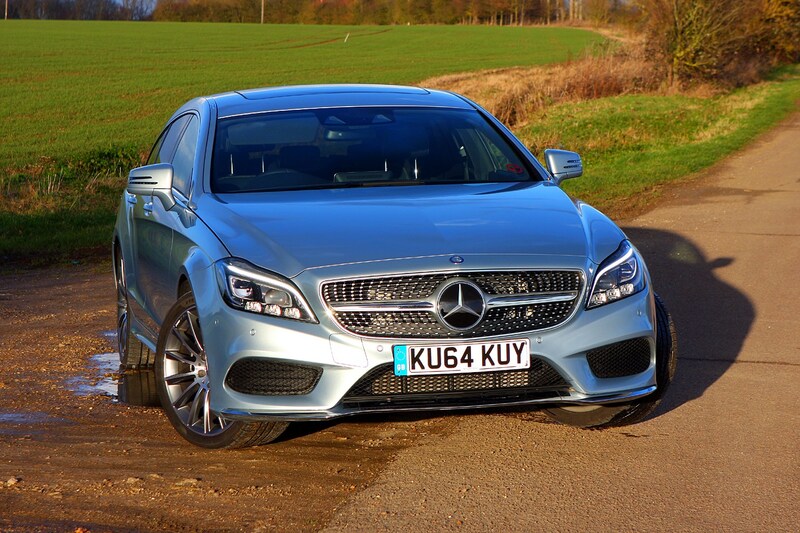 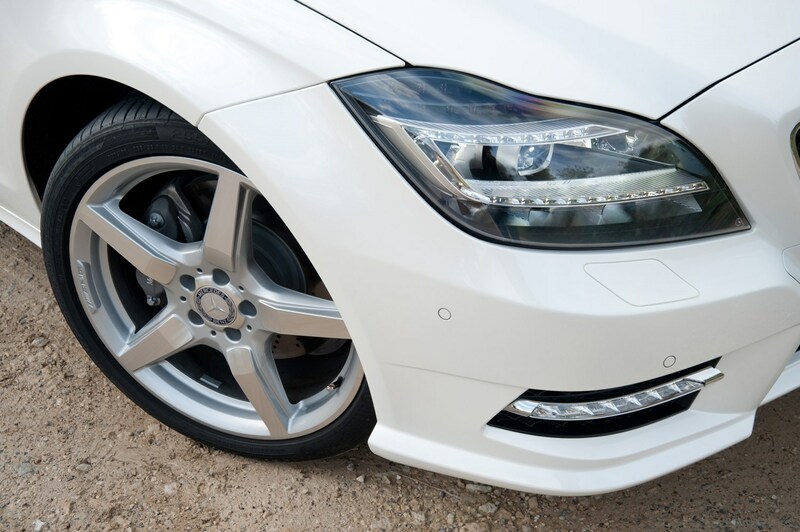 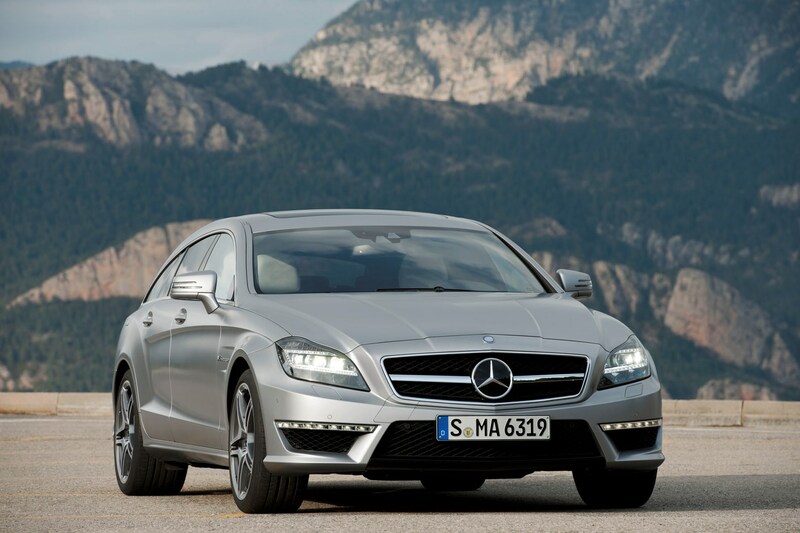 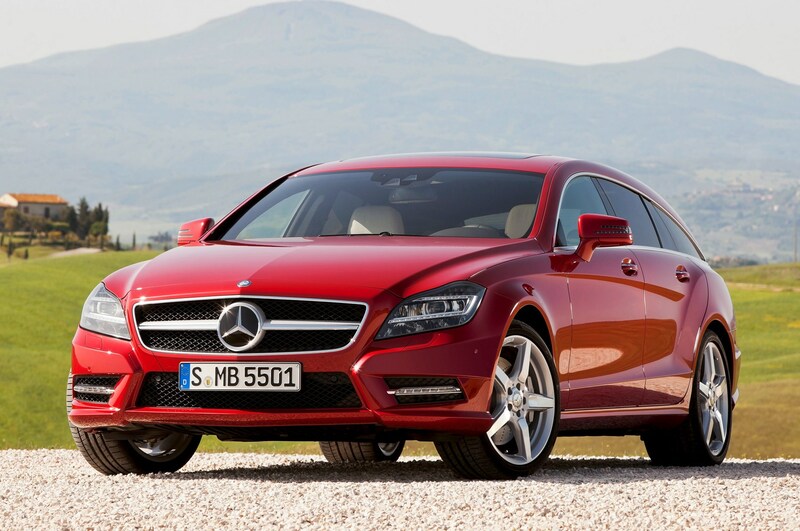 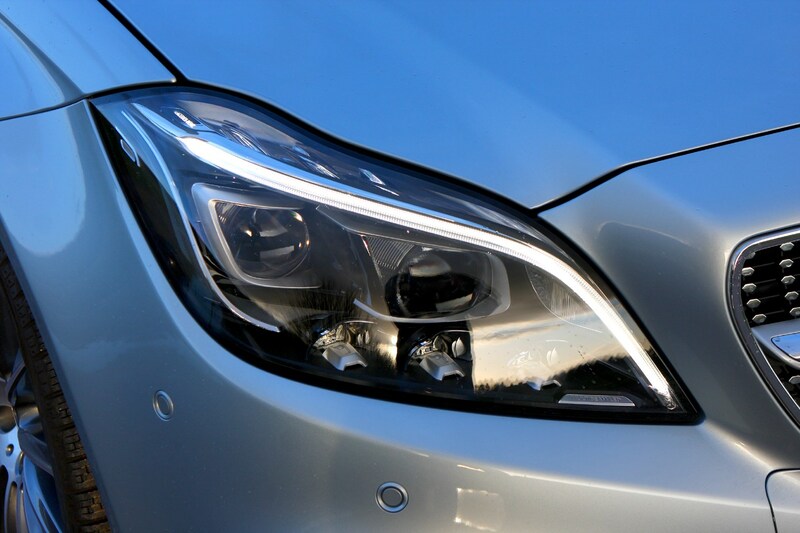 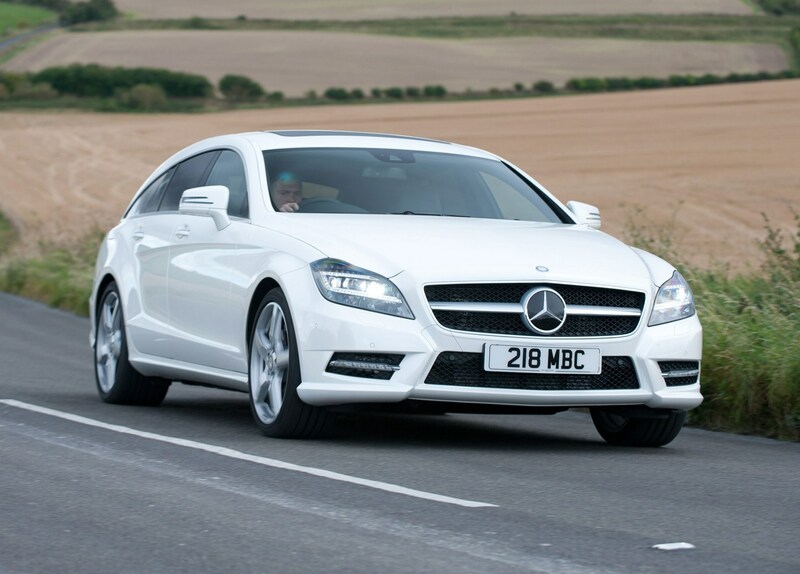 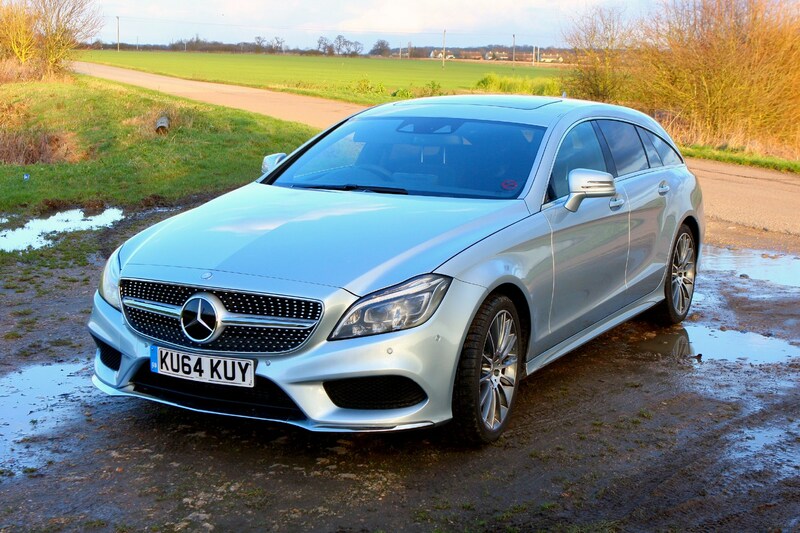 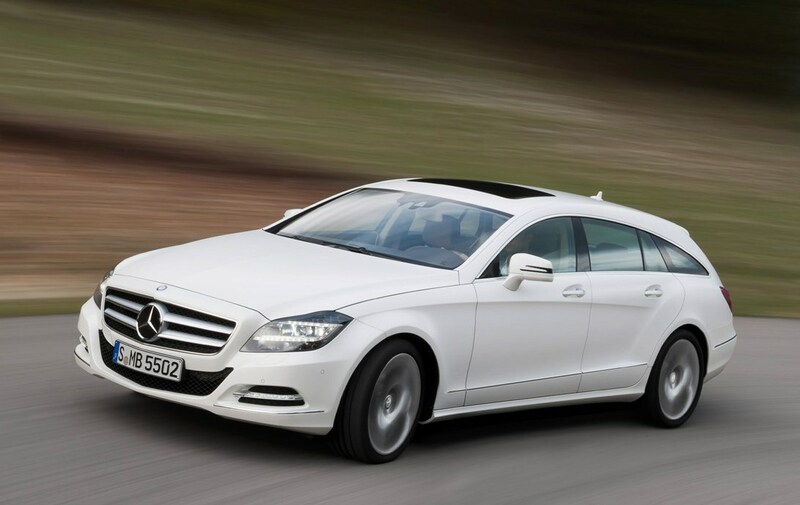 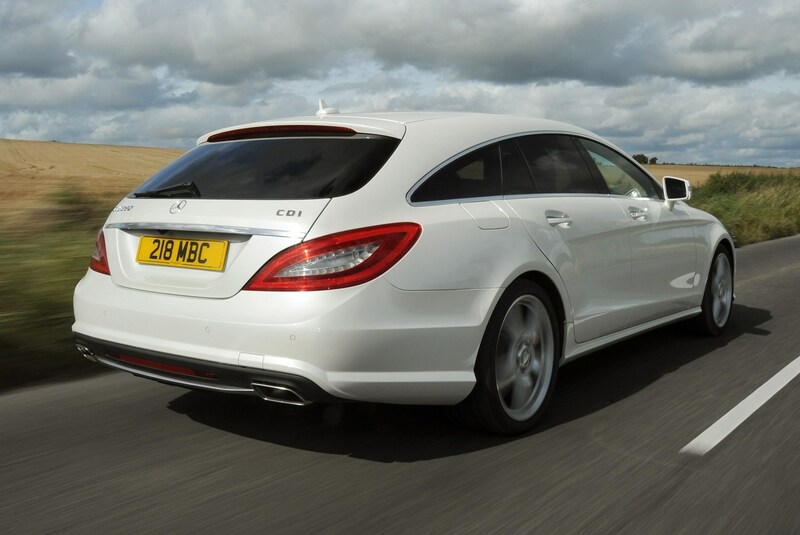 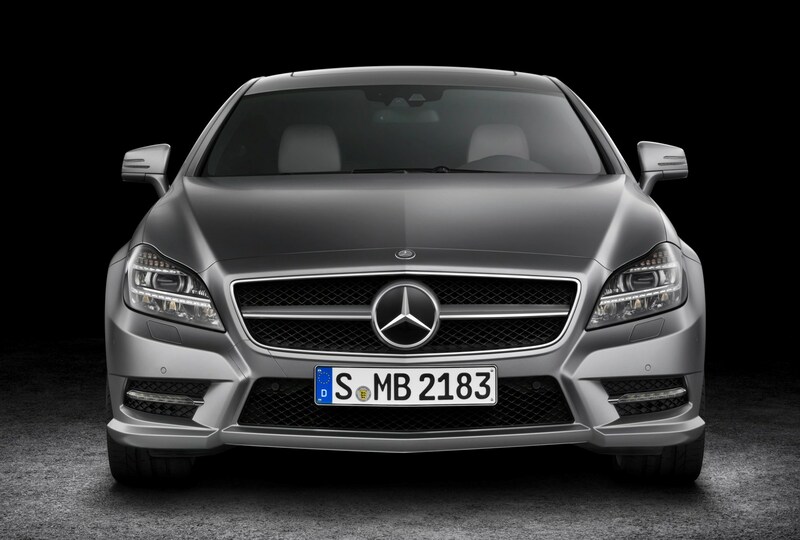 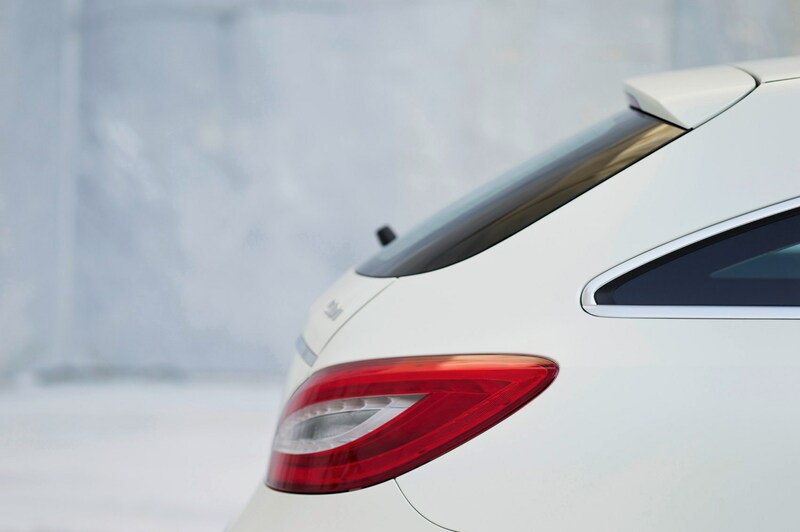 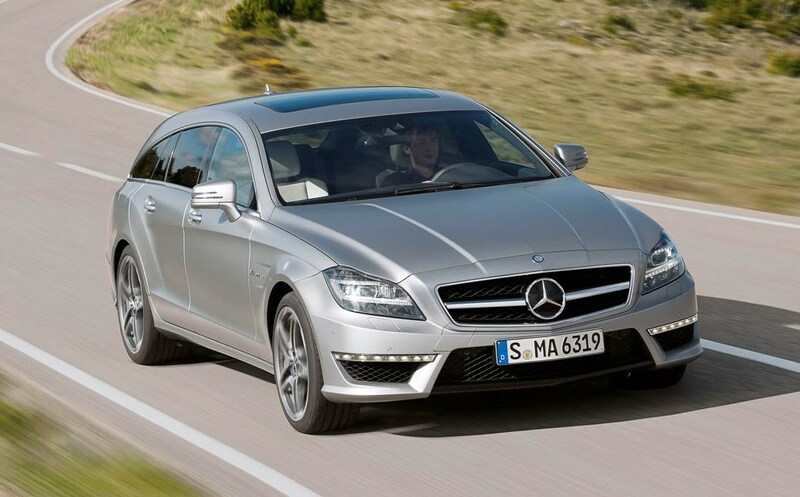 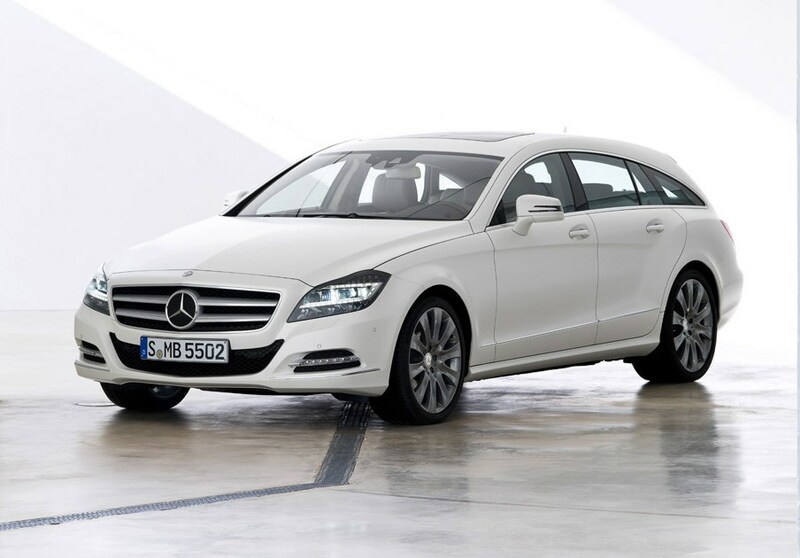 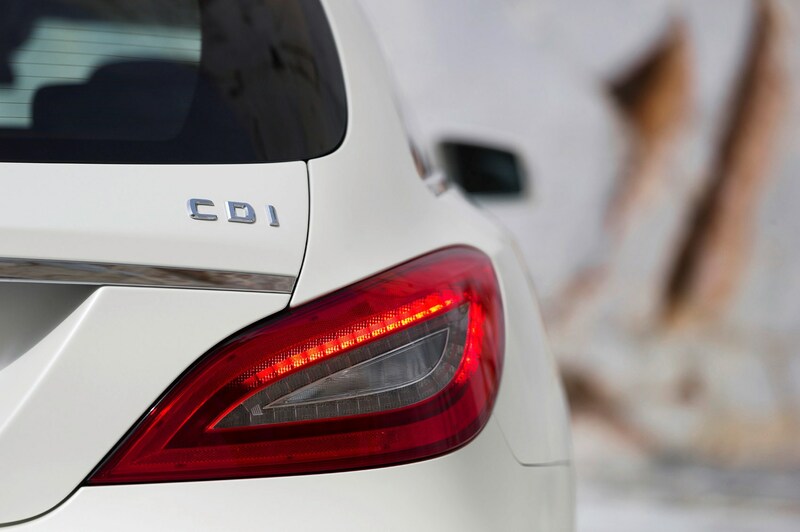 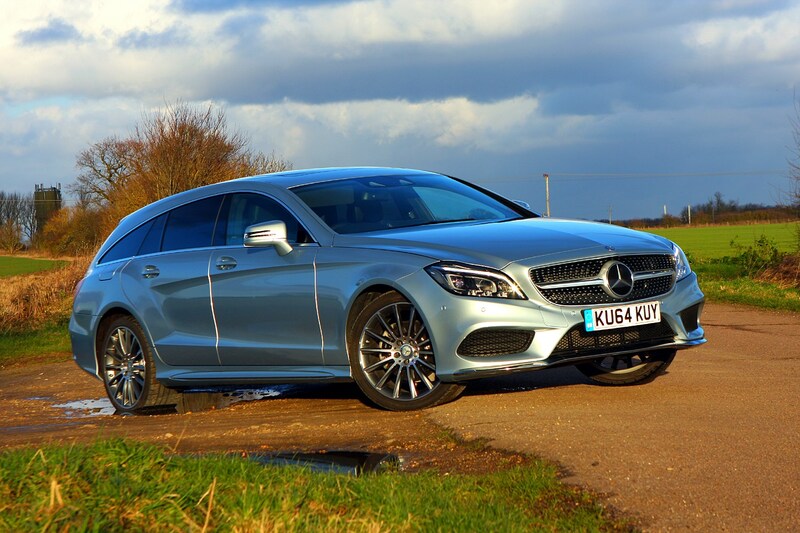 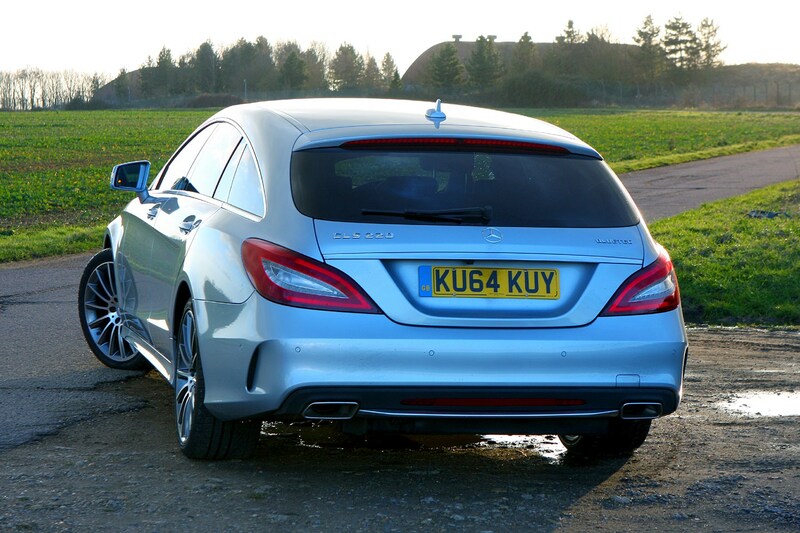 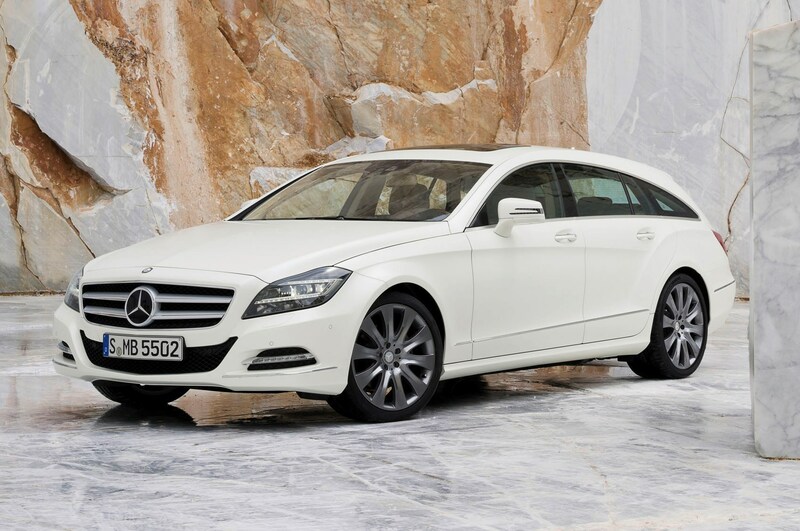 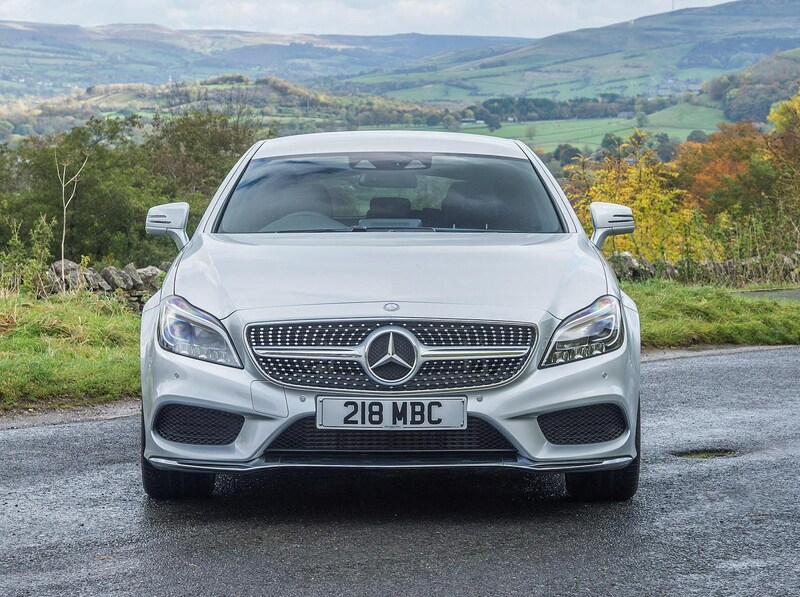 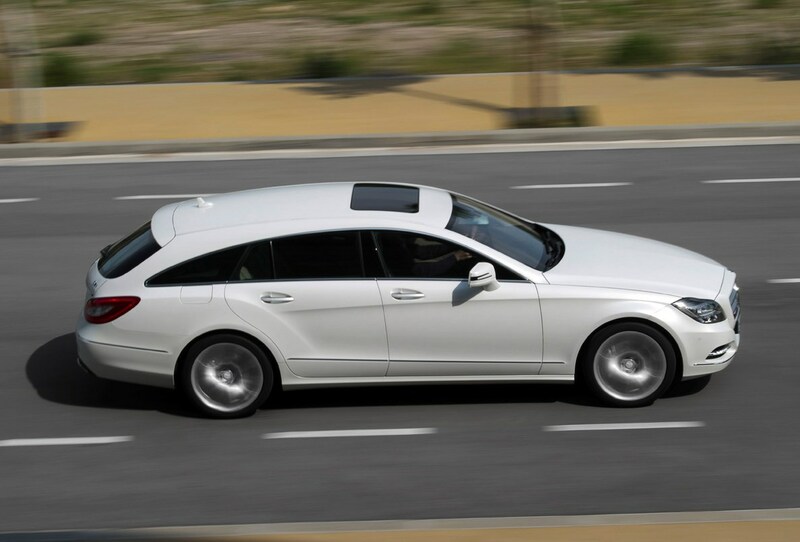 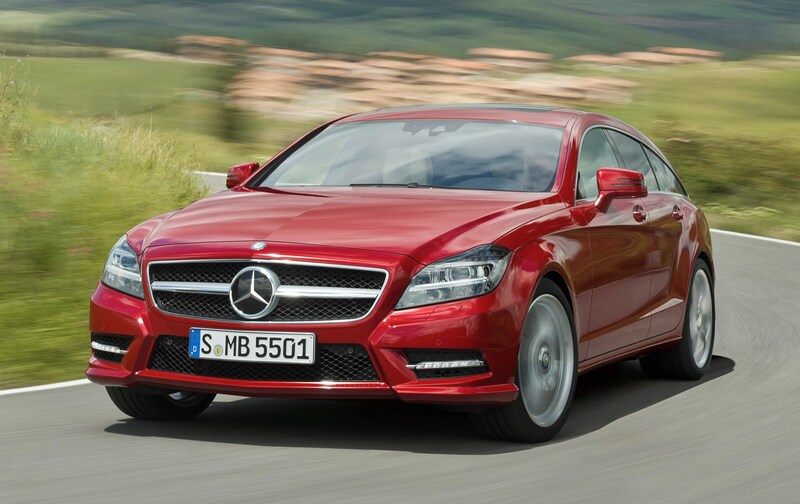 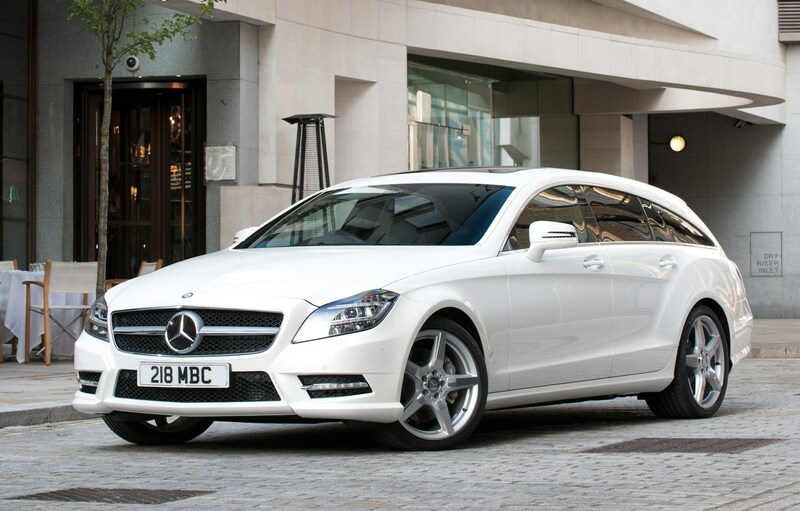 The entry-level model is the CLS250 CDI BlueEFFICIENCY which produces 201bhp. 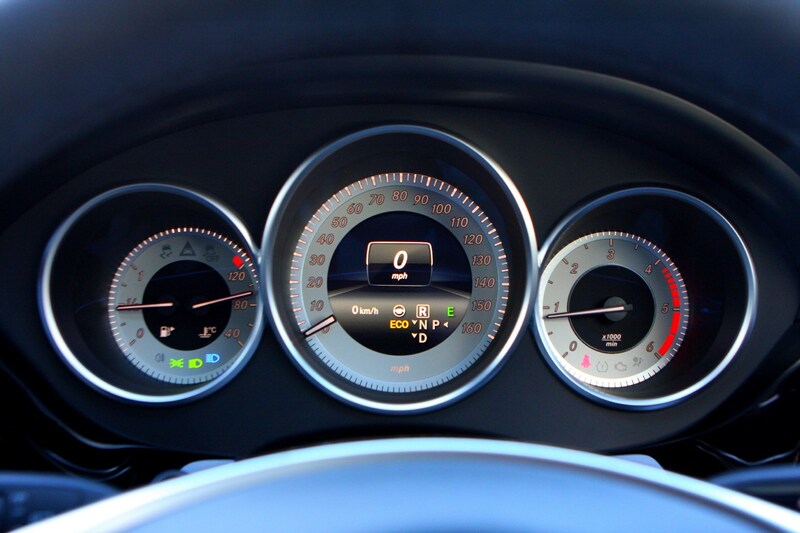 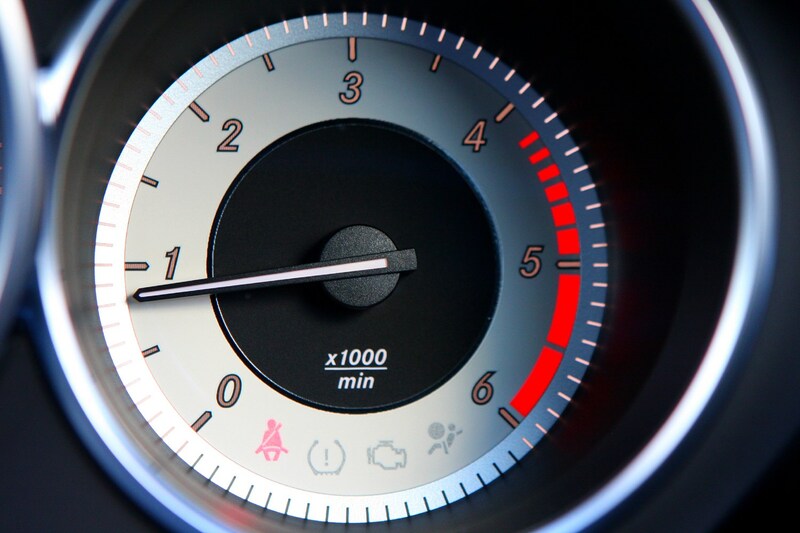 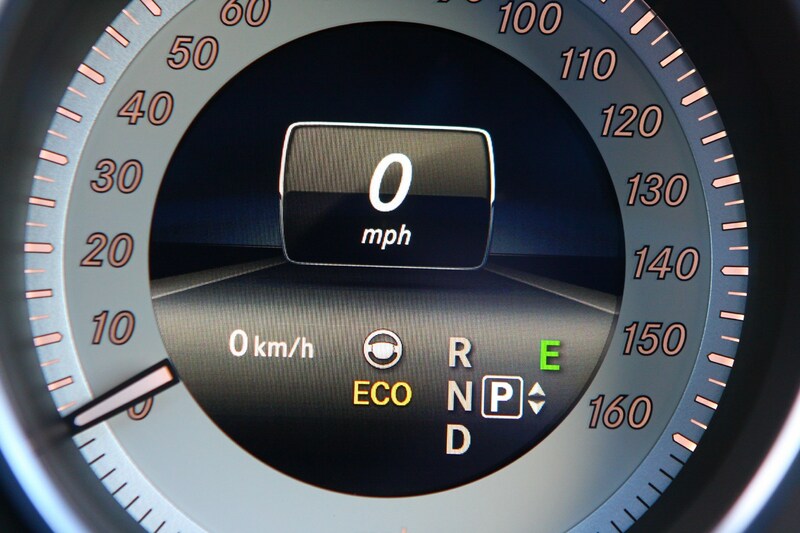 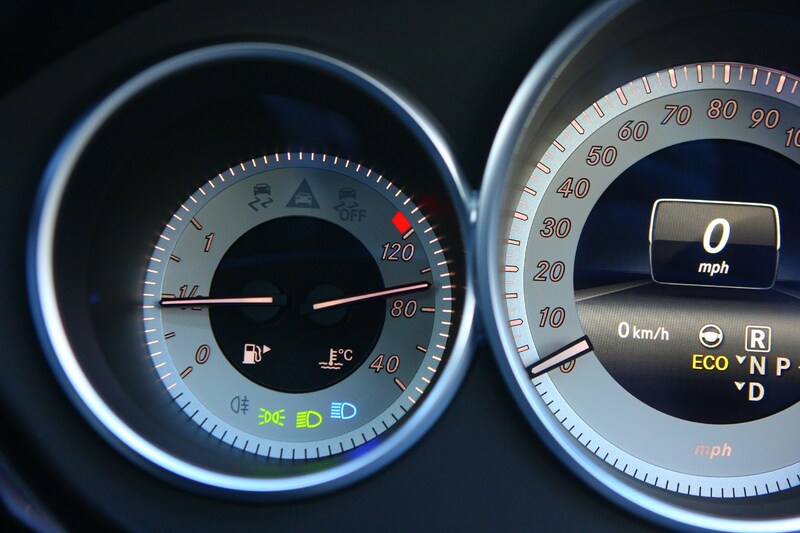 Combined fuel consumption is 53.3 mpg with CO2 emissions of 139g/km and a 0-62mph time of 7.8 seconds. 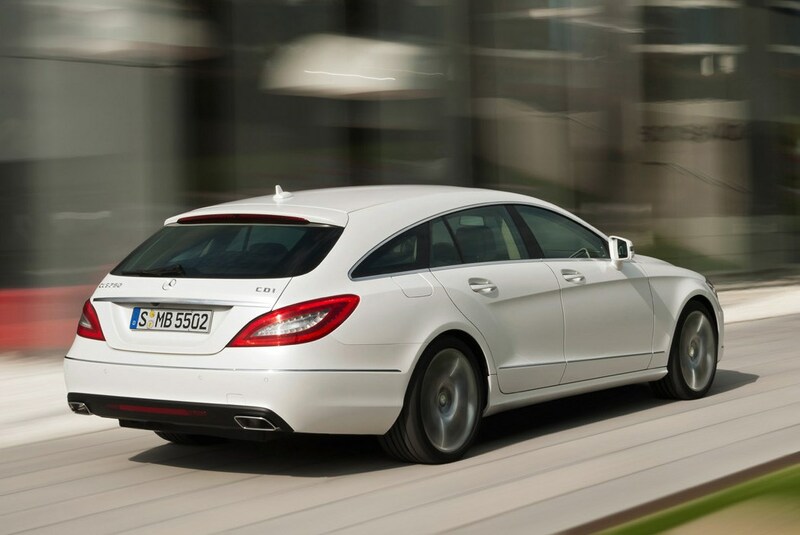 There’s also a six-cylinder model: the CLS 350 CDI BlueEFFICIENCY. 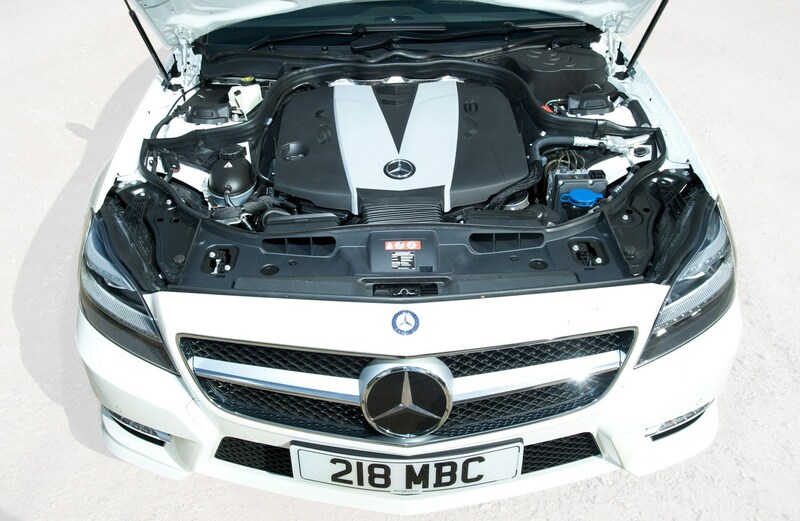 It produces 261bhp, returns 47mpg, emits 161g/km of CO2 and accelerates from 0-62mph in 6.6 seconds. 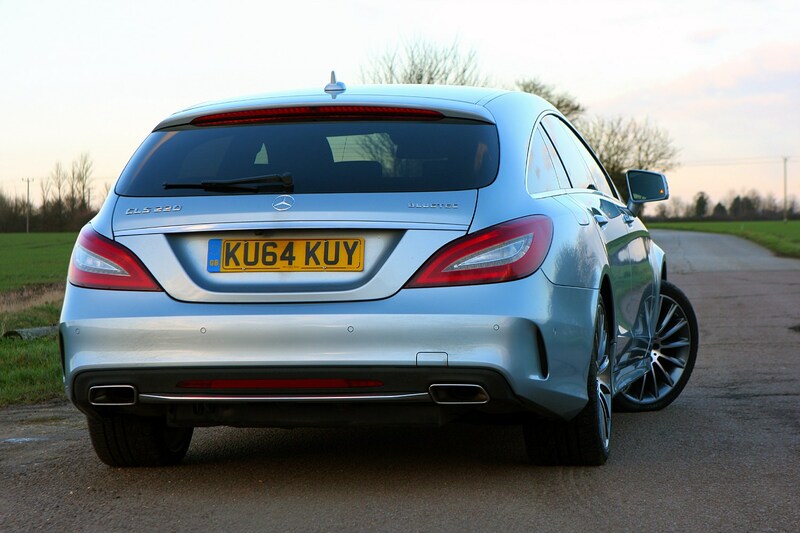 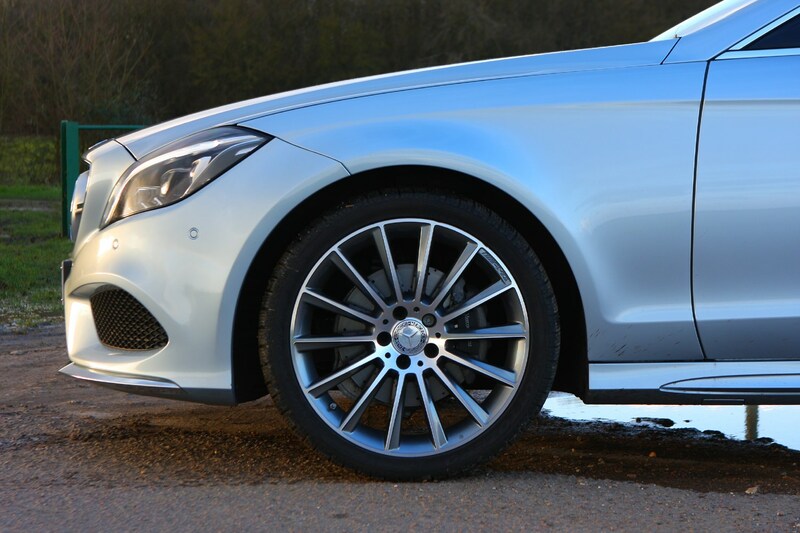 Then there’s the rather more bonkers 5.5-litre petrol-engined 63 AMG version that goes like a bullet. 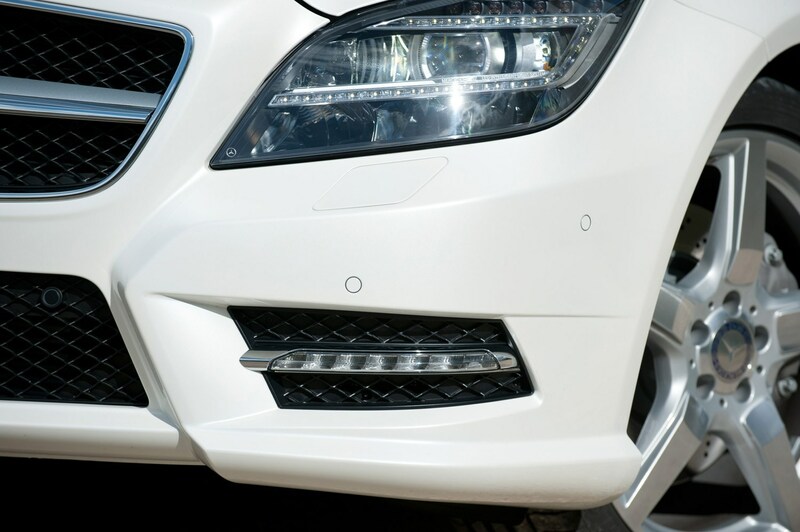 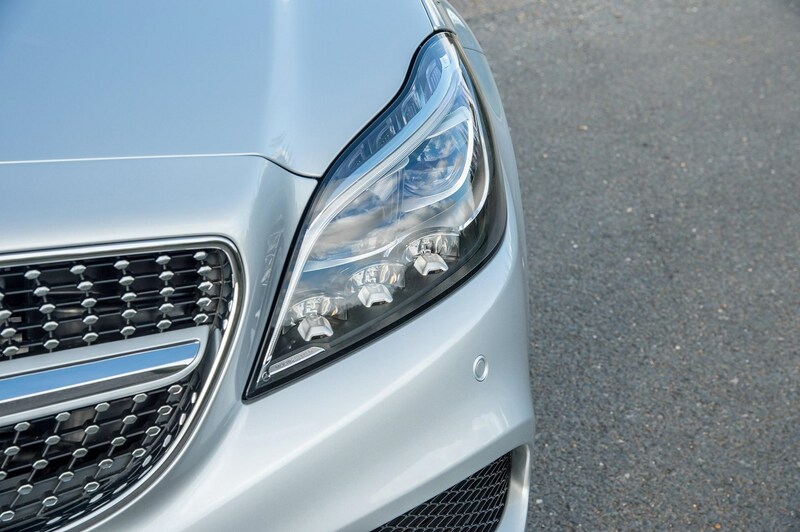 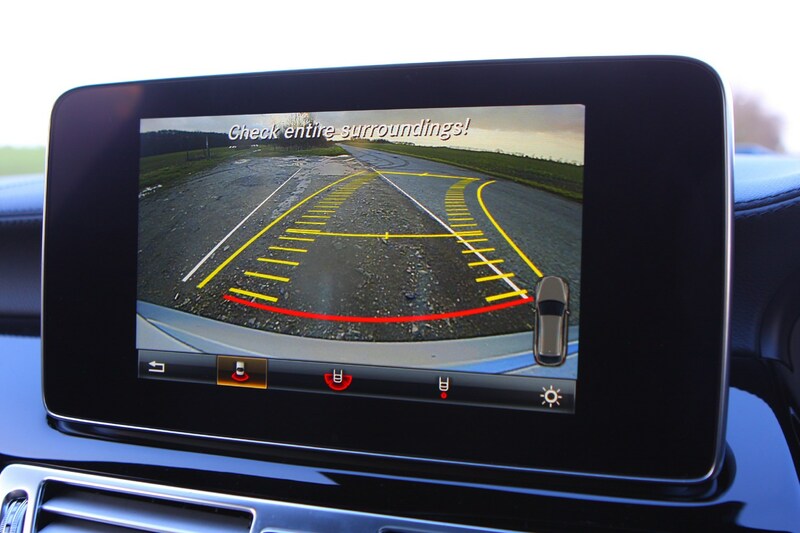 More than a dozen driving assistance systems to prevent traffic accidents and reduce the severity of a collision are included. 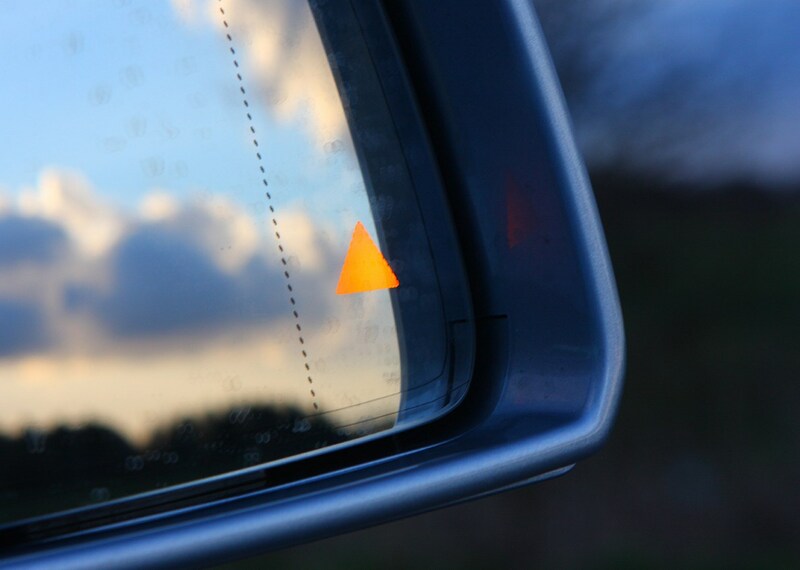 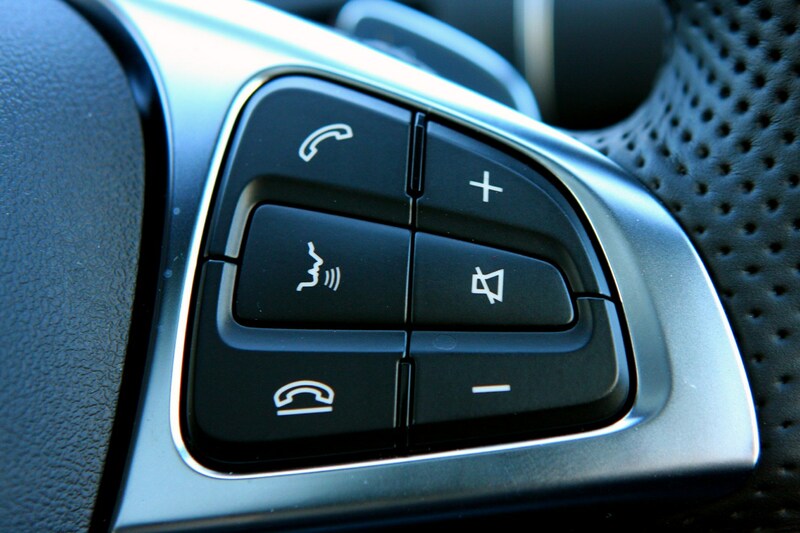 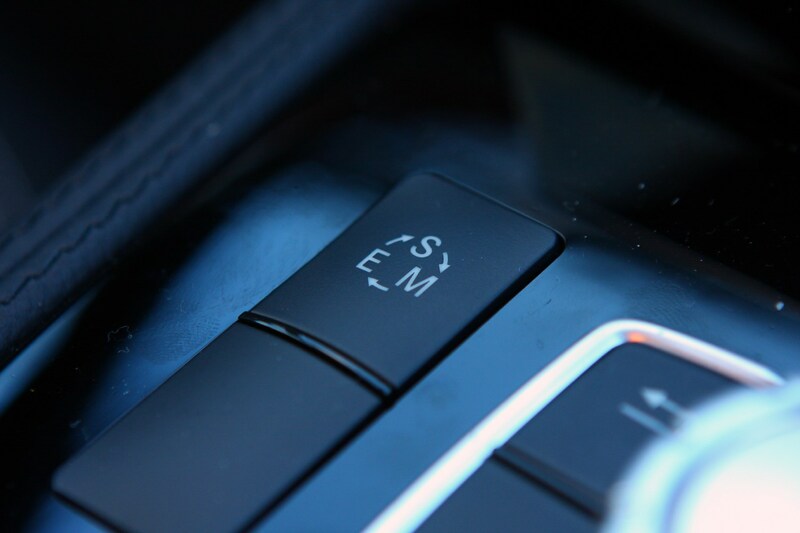 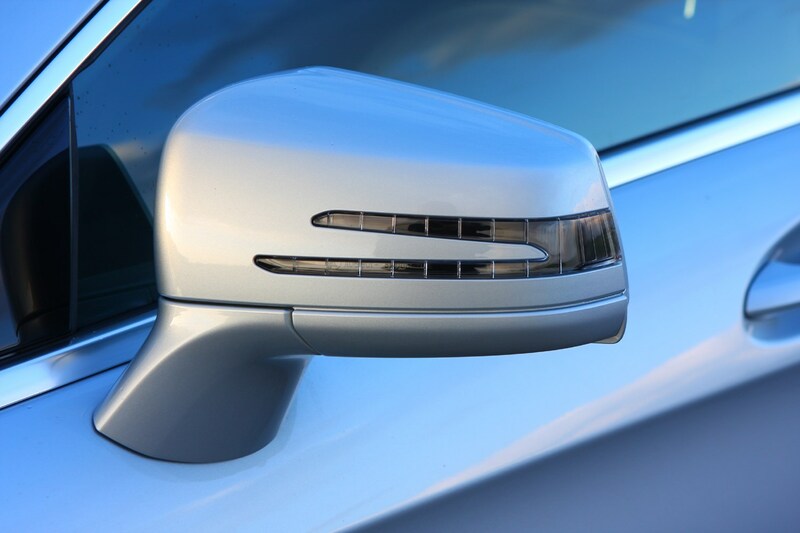 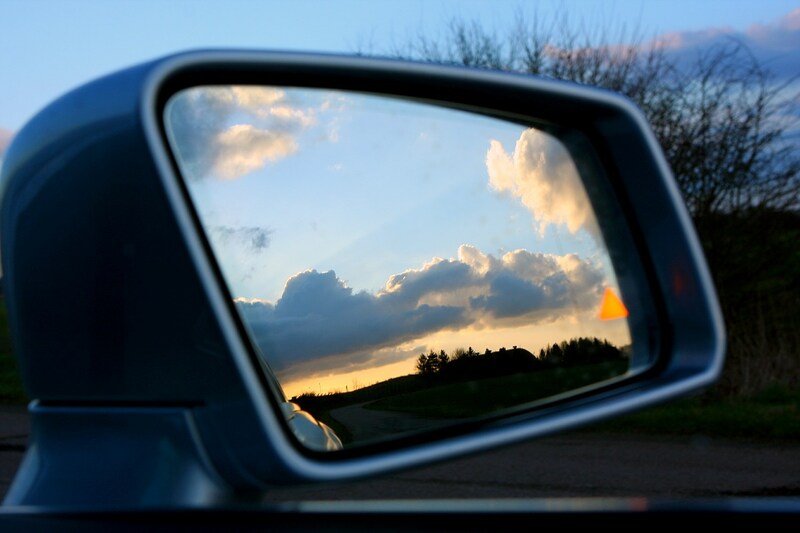 Active Blind Spot Assist and Active Lane Keeping Assist are available as part of the Driving Assistance package, in combination with Distronic Plus and the Pre-Safe system that preps the car if it thinks an accident is imminent. 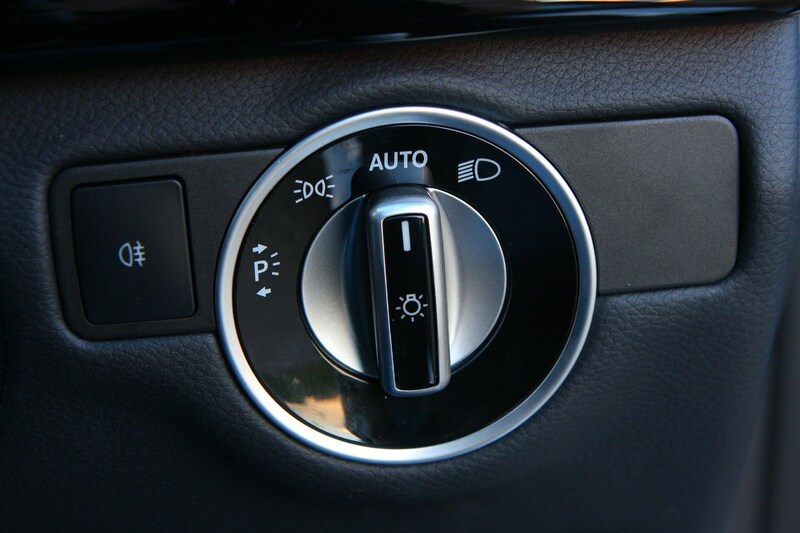 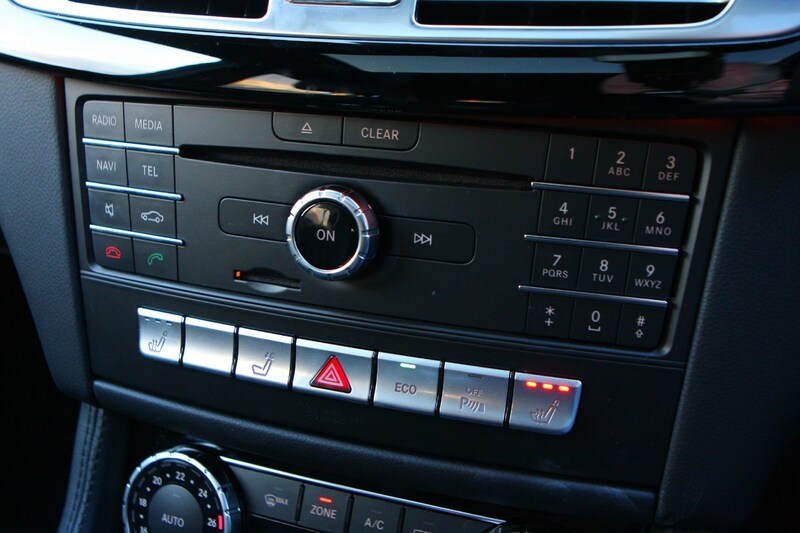 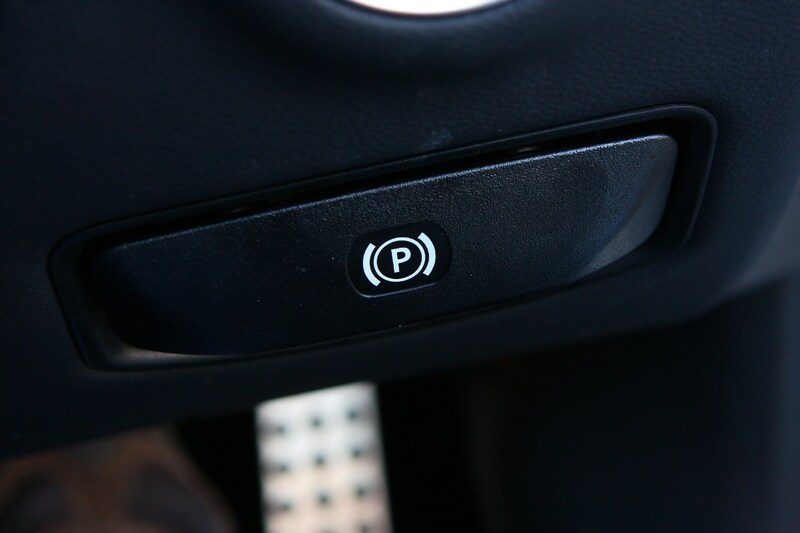 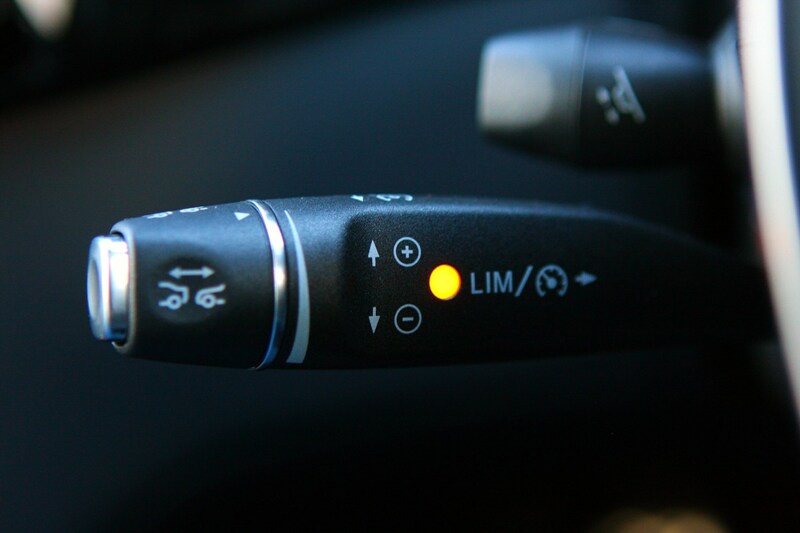 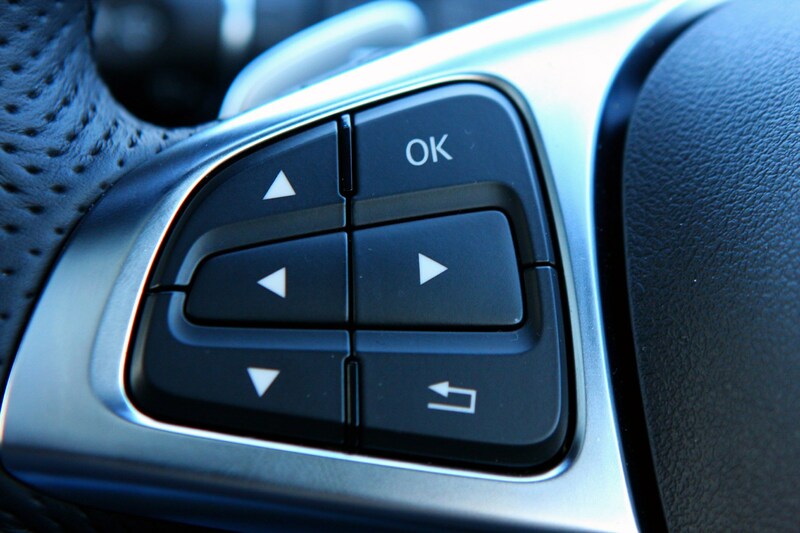 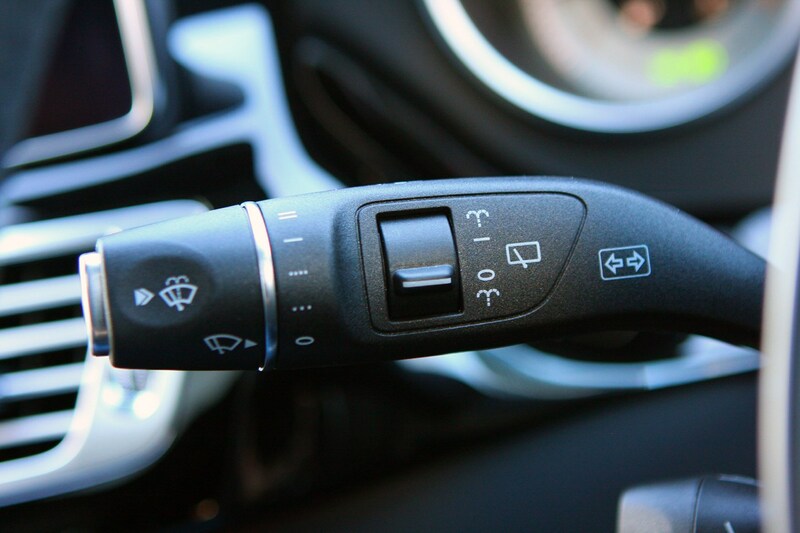 Both assistance systems are not only able to detect an unintentional lane-change or vehicles in the blind spot, but they can also correct the direction of travel by gentle brake intervention if the driver ignores the visual or audible danger warnings. 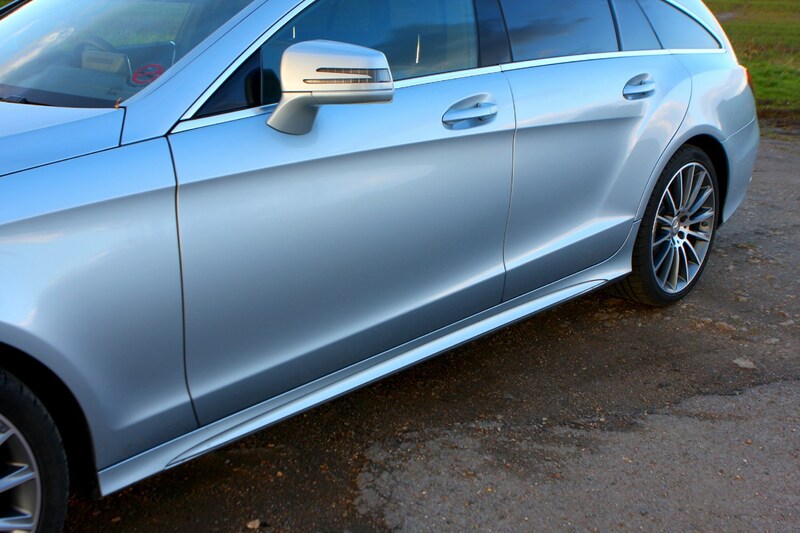 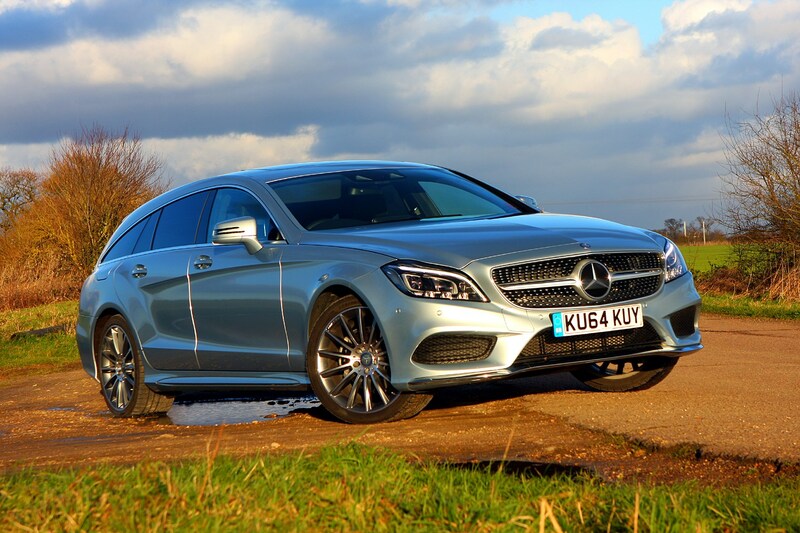 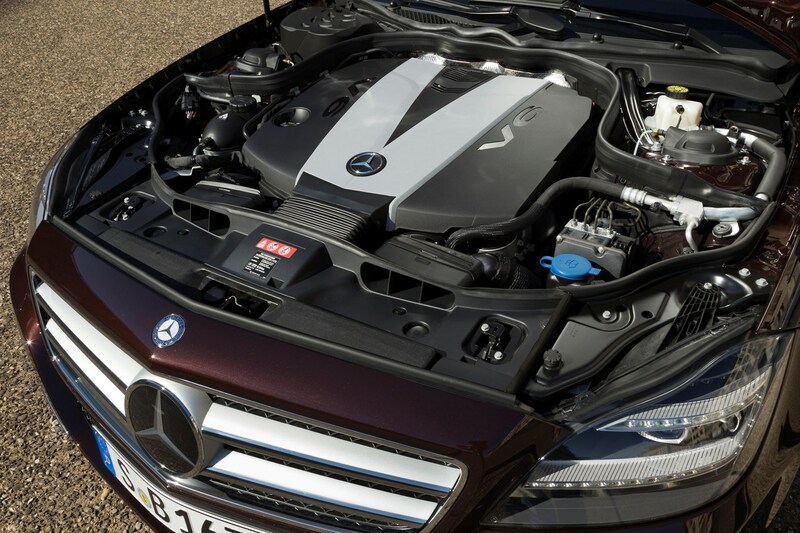 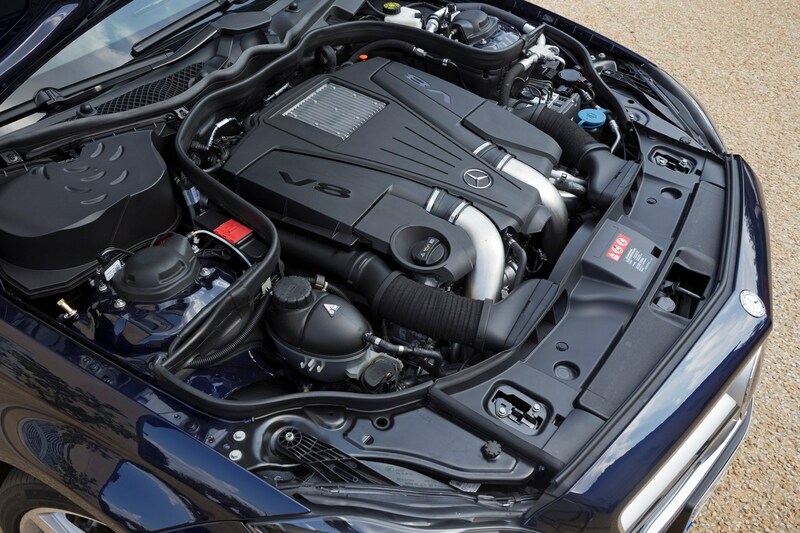 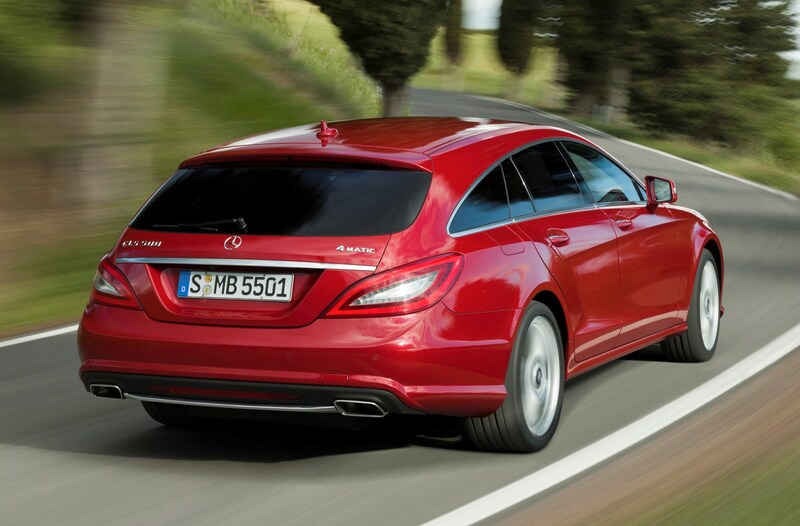 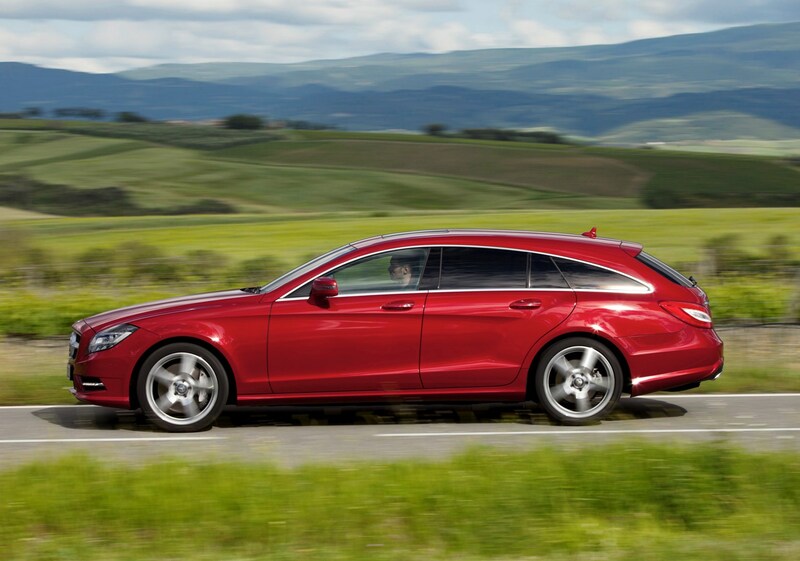 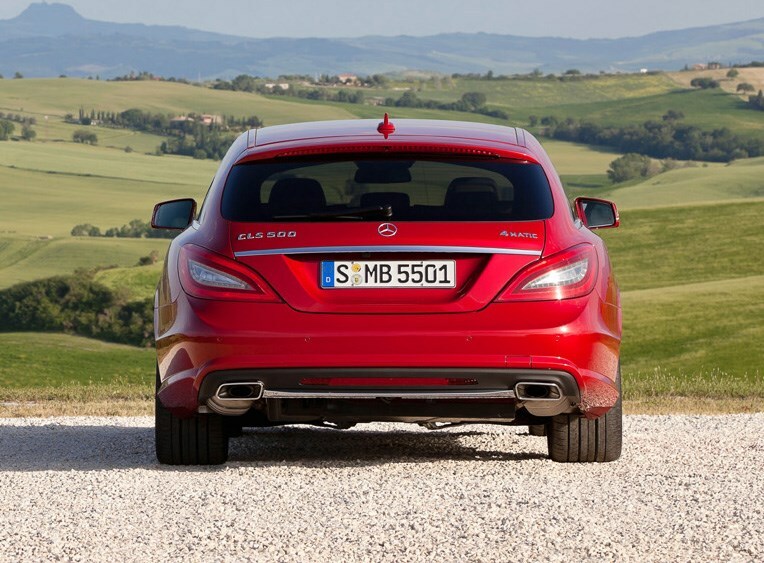 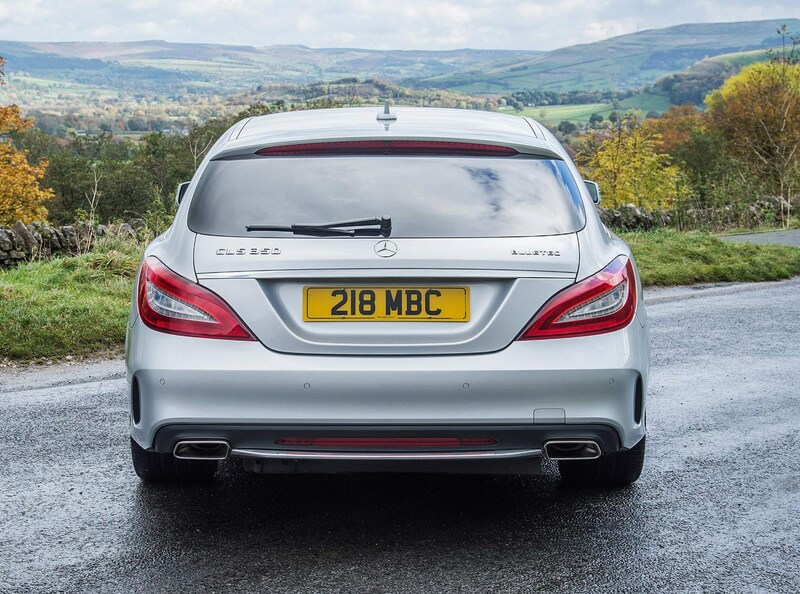 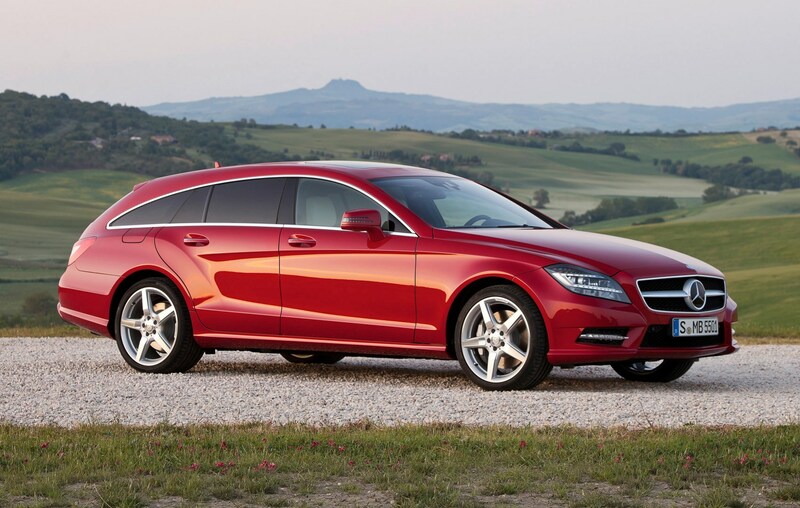 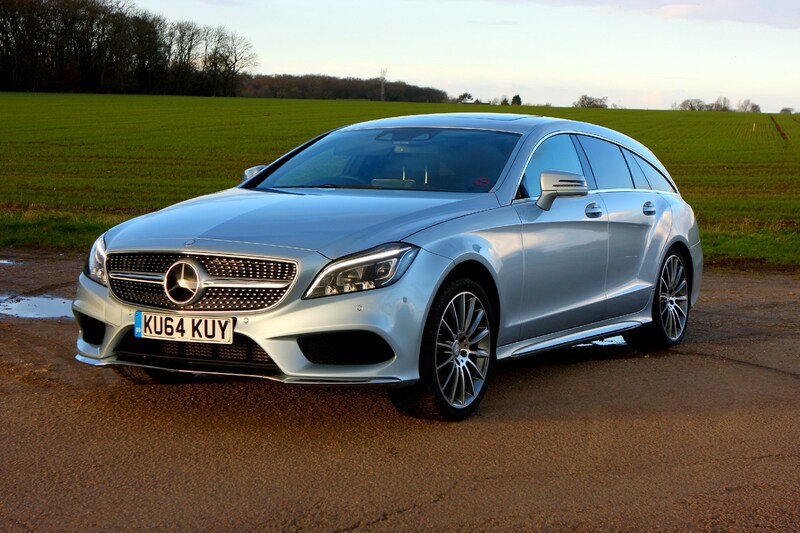 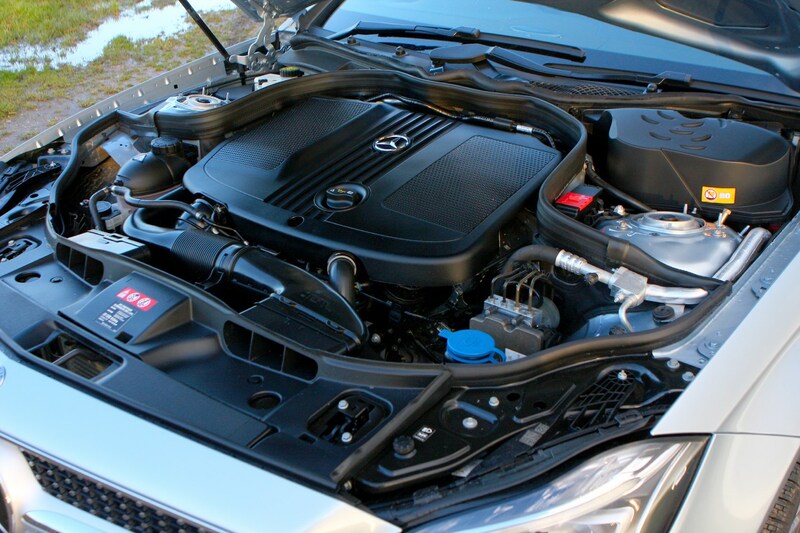 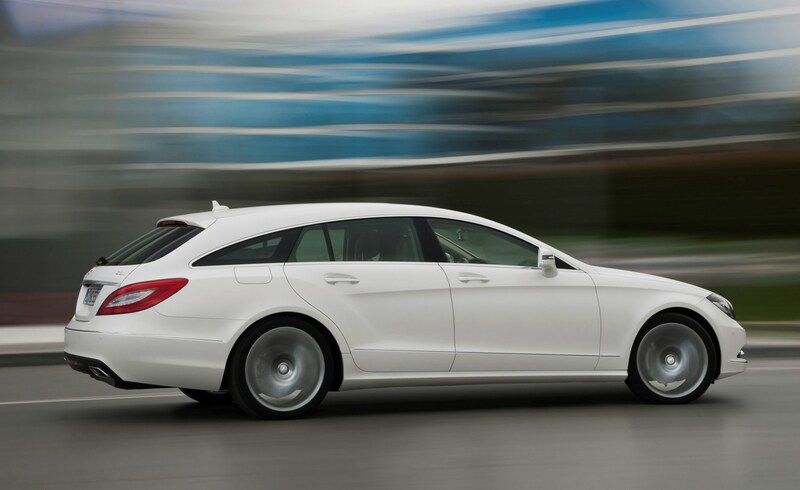 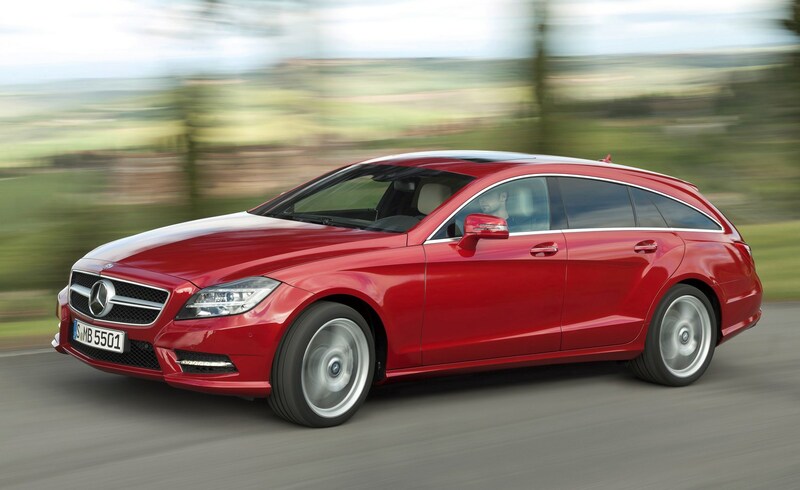 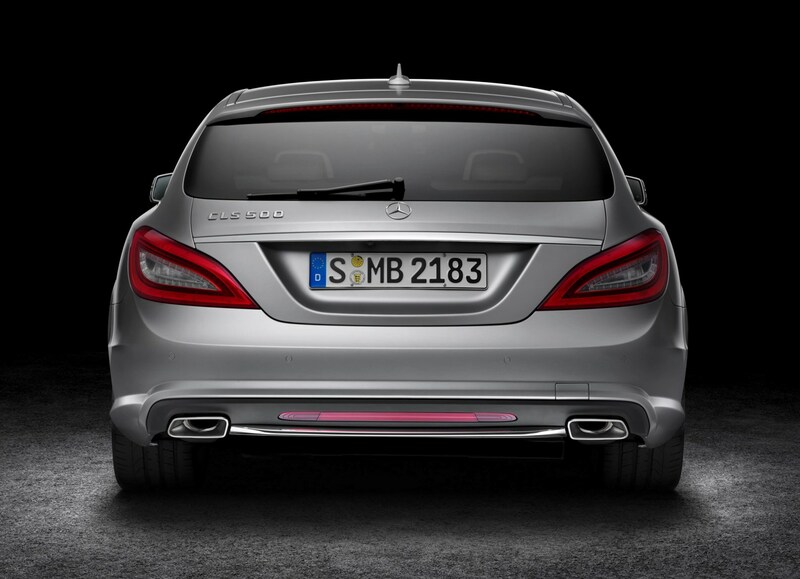 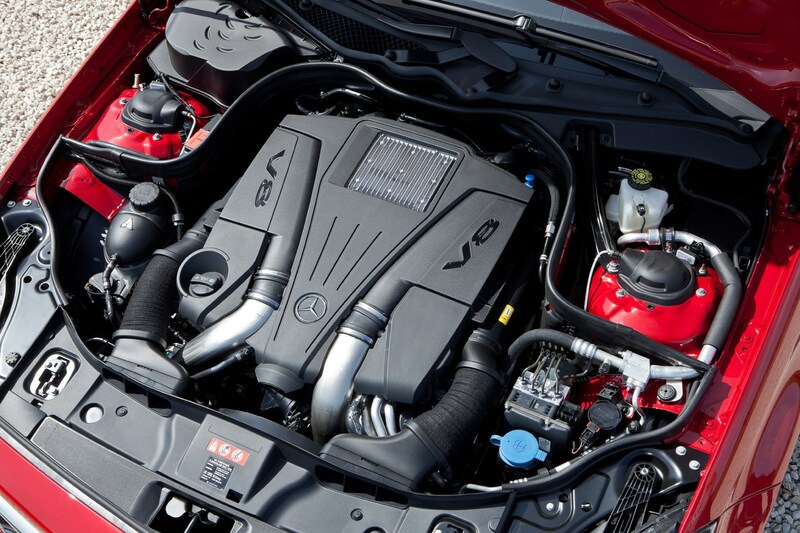 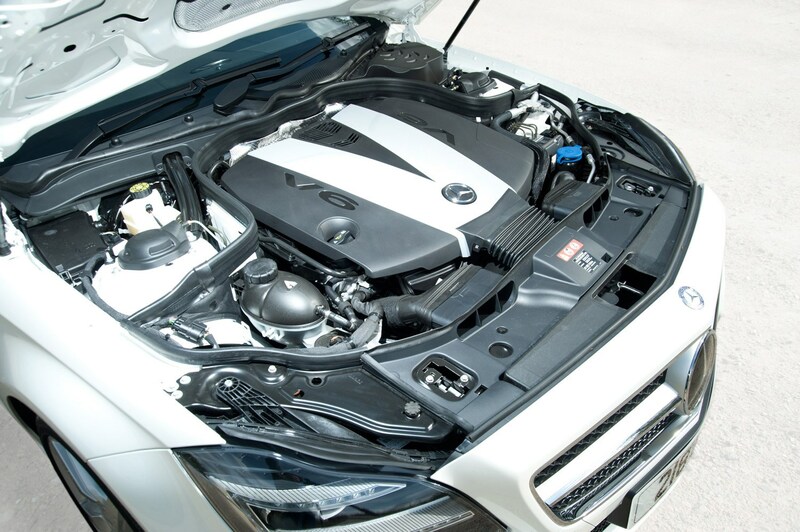 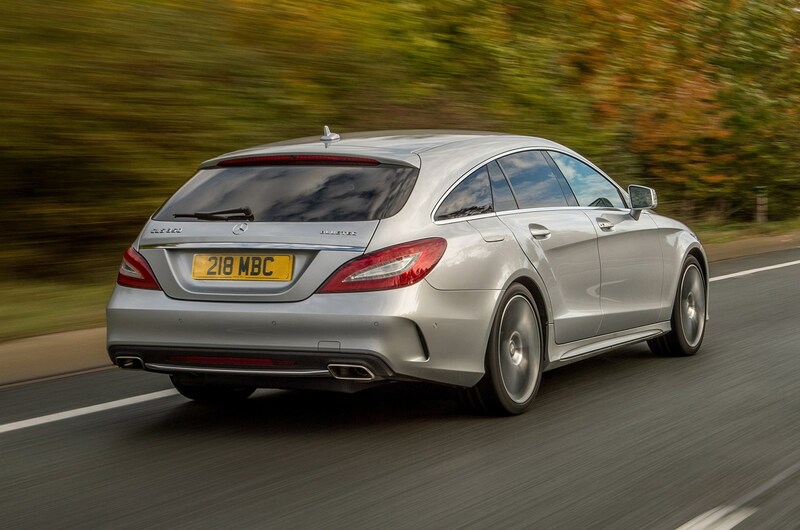 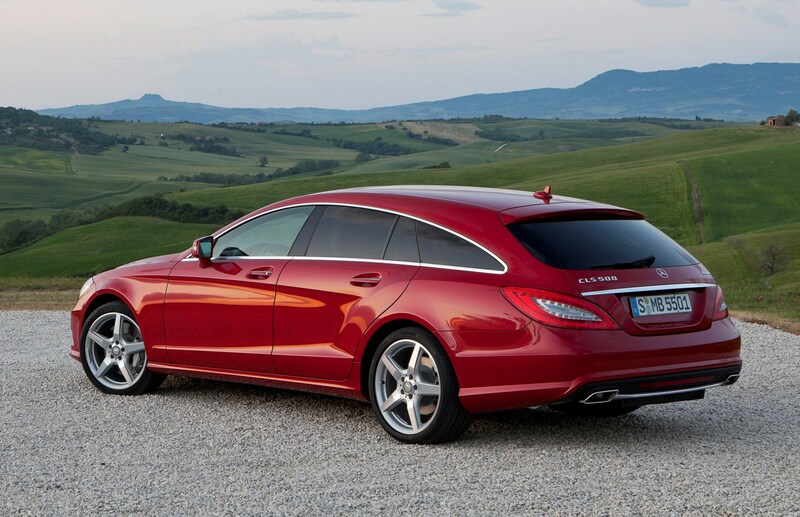 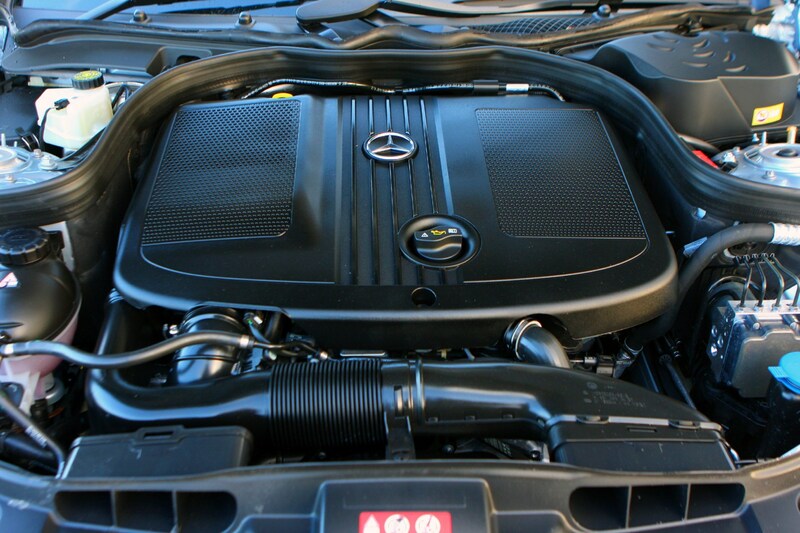 At the tail end of 2014 the CLS Shooting Brake had a series of updates applied, inside, outside and under the bonnet. 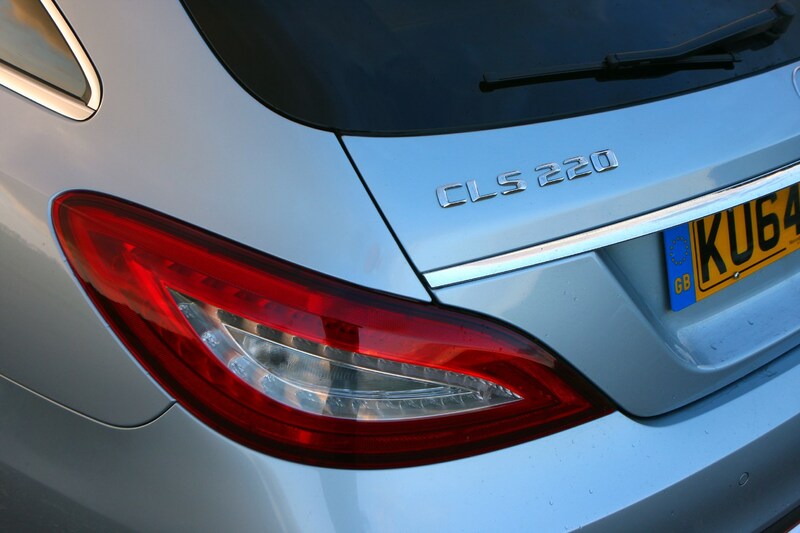 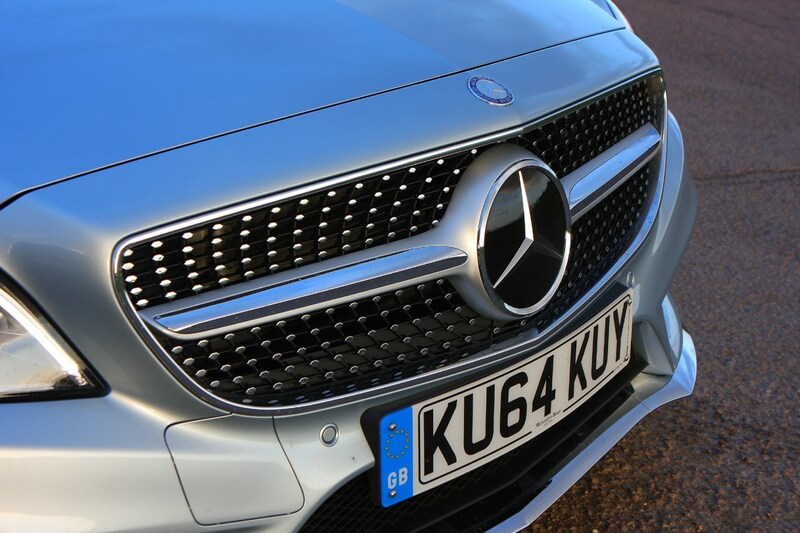 Most notable is the addition of a new entry-level 220 BlueTEC diesel model, which is economical and refined, but not particularly fast. 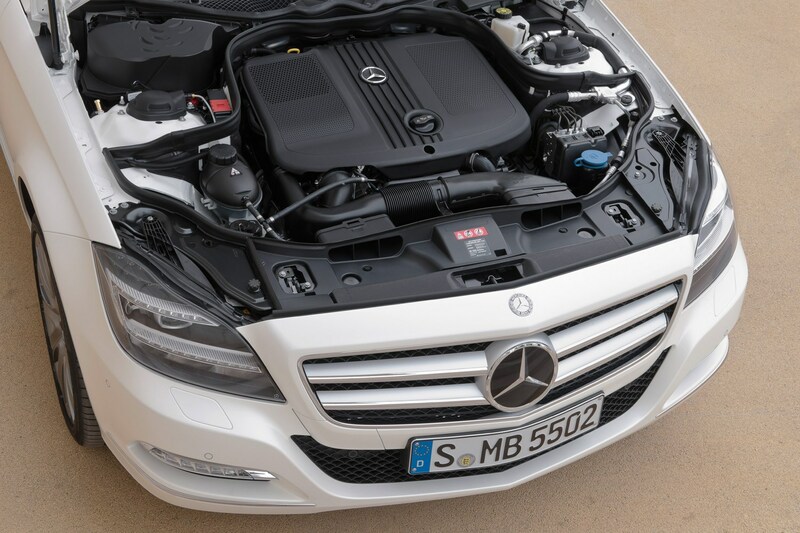 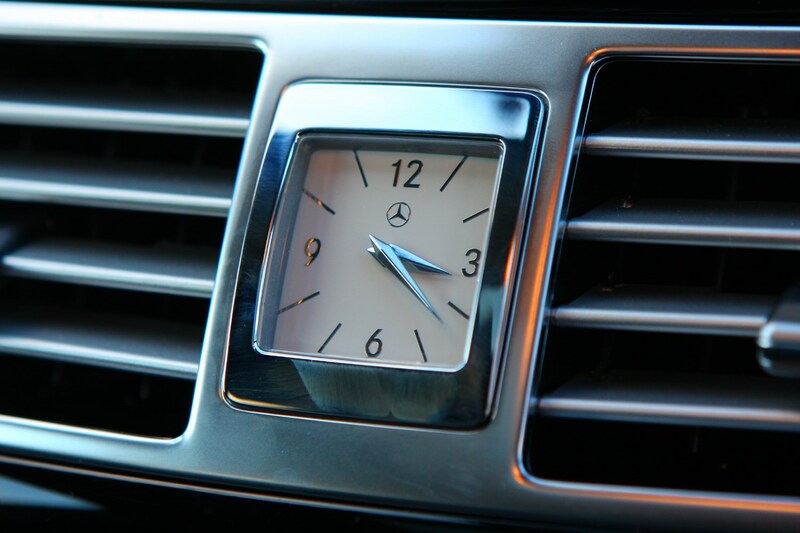 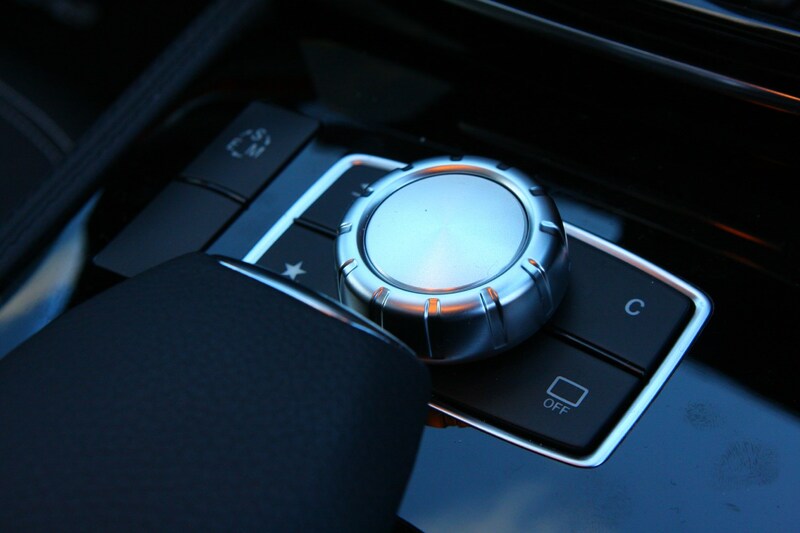 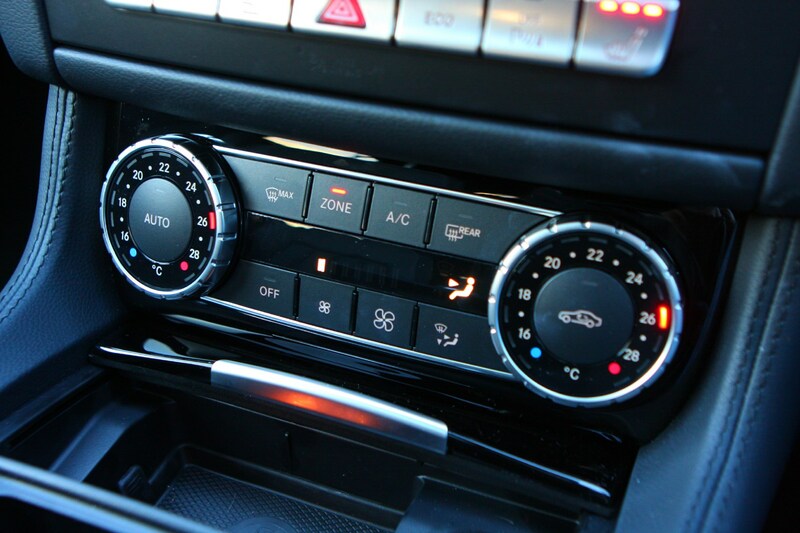 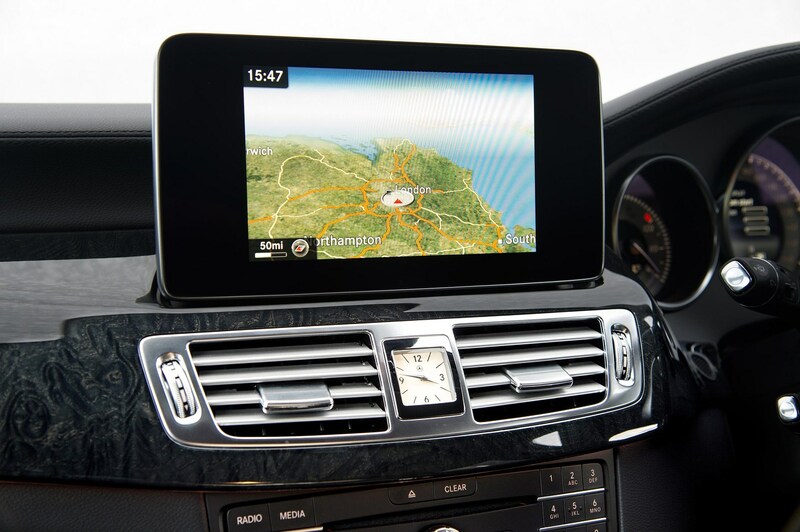 Refinement is further helped by the new 9G-Tronic nine-speed automatic gearbox, which is available on the 220, 250 and 350 BlueTEC diesels as well as the 500 petrol. 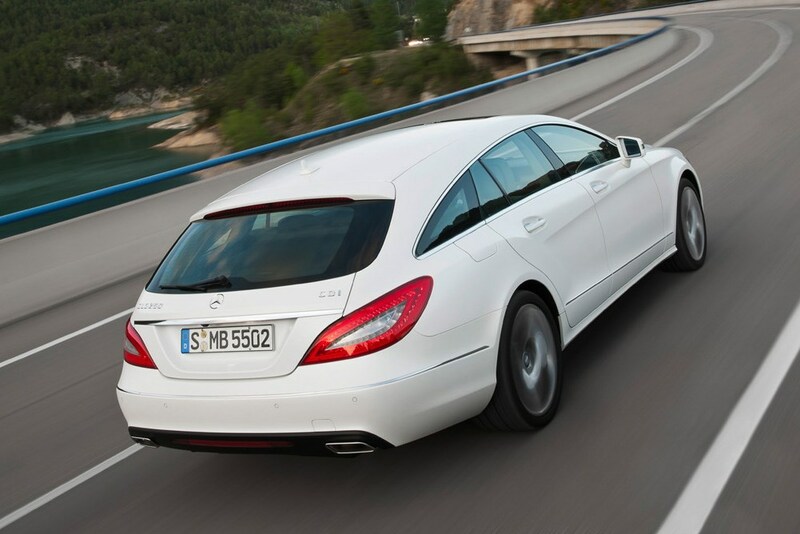 Still operated off the column stalk, it offers even lower rpm at cruising speeds to help with economy and efficieny. 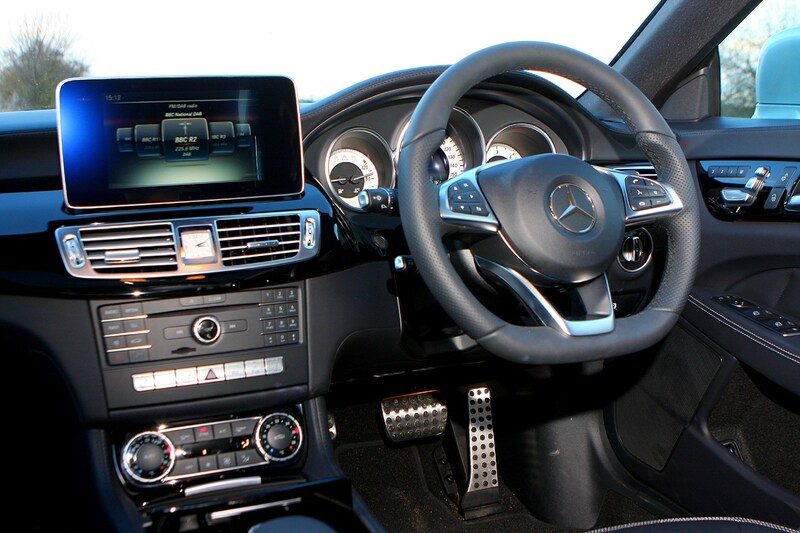 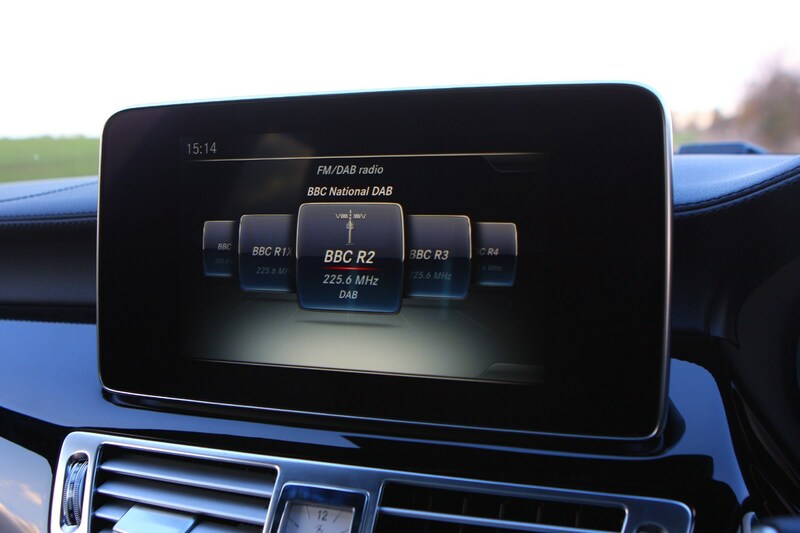 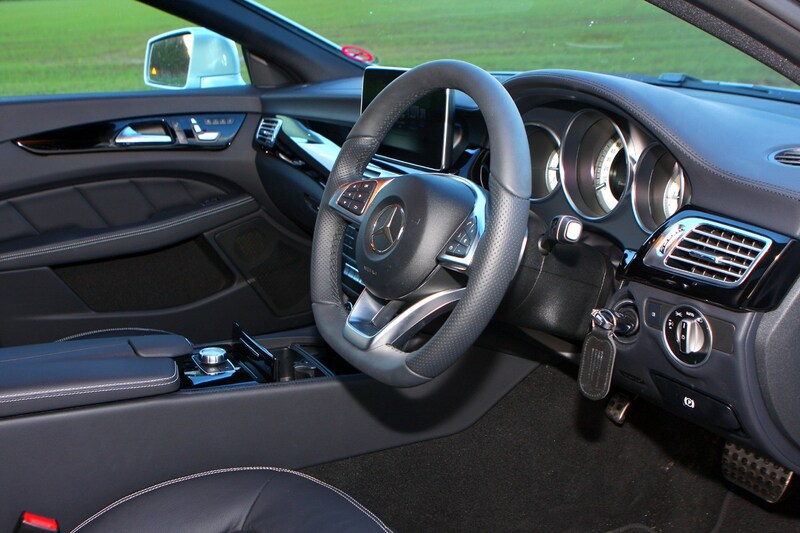 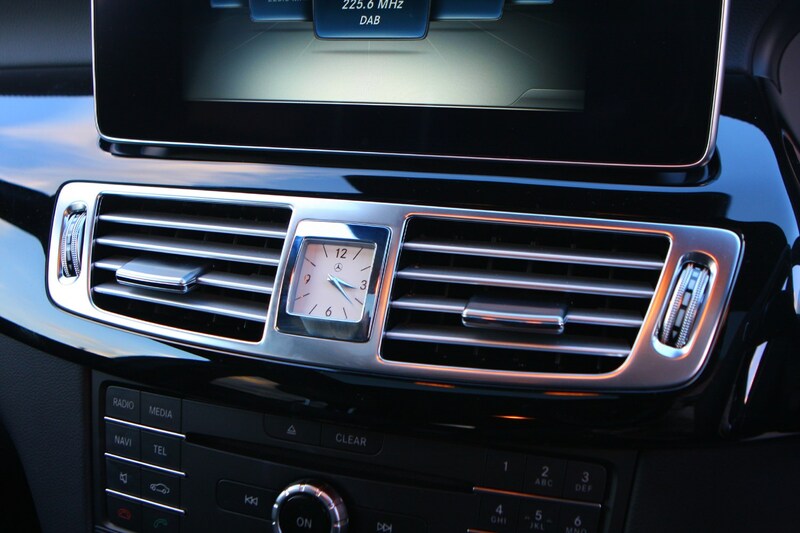 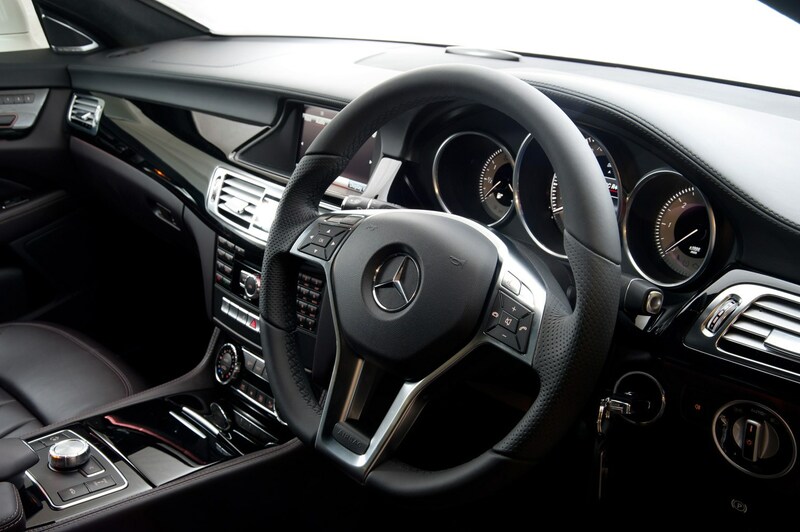 Inside there's a new steering wheel, familiar from the firm's other models and a new 8-inch colour screen sat on top of the dashboard, though it's still controlled by the company's Comand rotary dial rather than the new touchpad seen on the S-Class and C-Class. 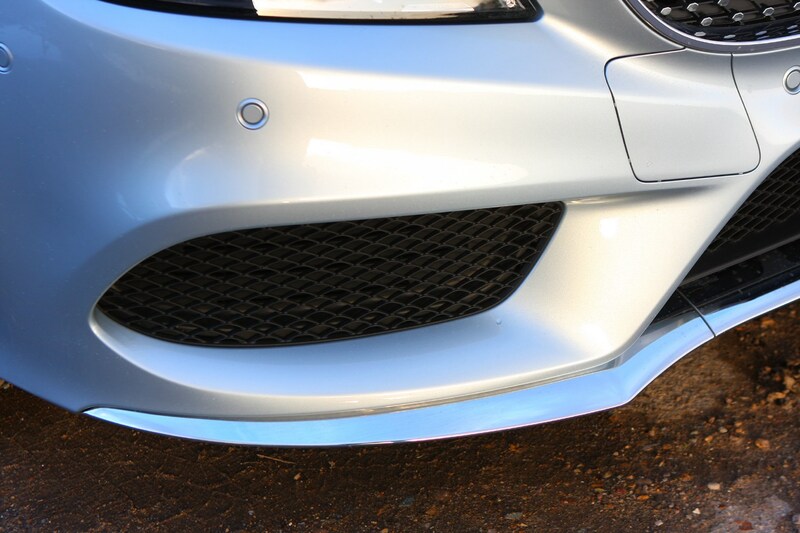 Outside new lights at the front make it look more aggressive, whilc the lower bumper design is more in-keeping with the family face.